Because we now live by Lake Chapala, Guadalajara is our local big city. It is only about a half hour drive from here to its outskirts. 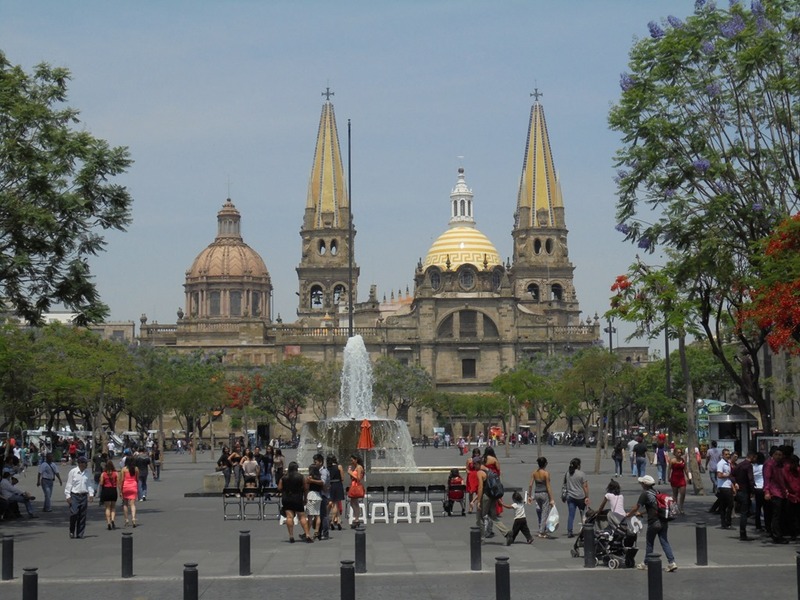 There are good buses between Ajijic and Guadalajara, and we wanted to see if we could use them to visit the city and get to know it. Around the historical buildings many of the streets are blocked off, so you can walk freely through the area. This is quite nice for a big city. 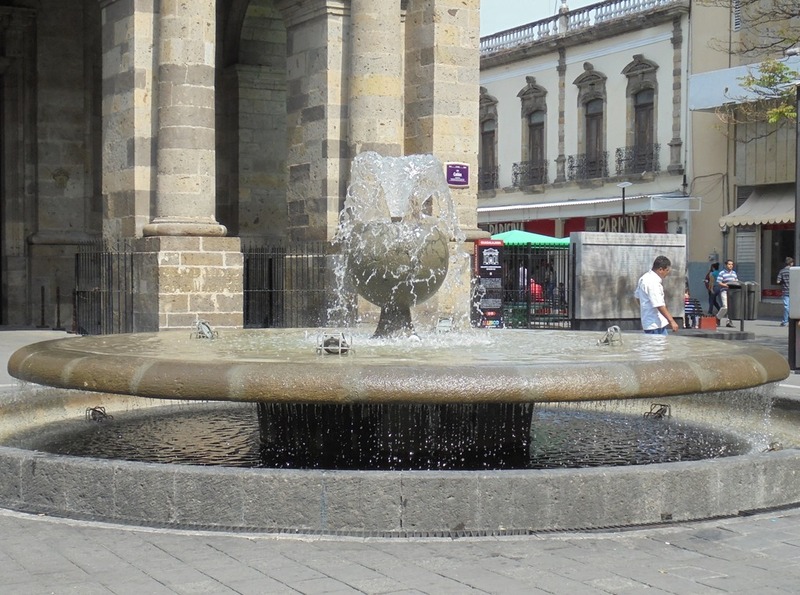 First, a bit of history for those not familiar with Guadalajara. This is an old city (for European cities in the Americas). It was founded in 1542. It is almost 500 years old. This was just 50 years after the Columbus “discovery,” and fewer than 25 years after Cortes’ conquest of Montezuma. For a bench mark, the oldest continuously occupied city in the US is Saint Augustine, Florida, founded in 1565, almost 25 years later than Guadalajara. Where we will walk today we will see buildings that express a lot of this history. 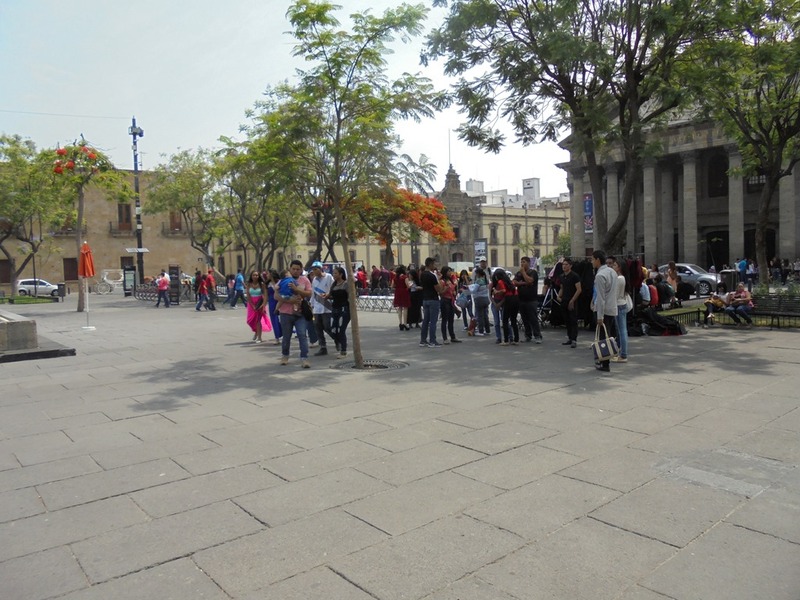 We got to Guadalajara easily with the bus system. We took We took one bus from our house, then the express bus that stops across from the Walmart on its way from Ajijic. We got off the bus and met our friends, then drove a short bit and parked near today’s walk area. Next time we will, I guess, take a taxi when we come up by ourselves. As we walked we passed by the truck shown below. 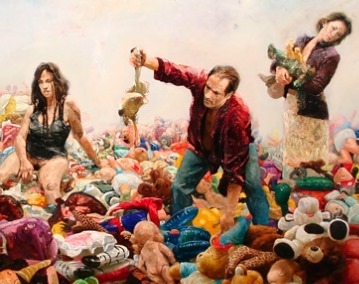 From the sign in the lower right of the picture, this painting is by Sergio Garval, entitled Exquisitos pepenadores – “Exquisite scavengers.” Sergio Garval is a Guadalajara artist who has achieved great international recognition. He has won many awards, and has, since his first show in 1994, had more than 40 solo exhibitions and over 150 group exhibitions in galleries and museums in Mexico, Latin America, USA, Europe and Asia. 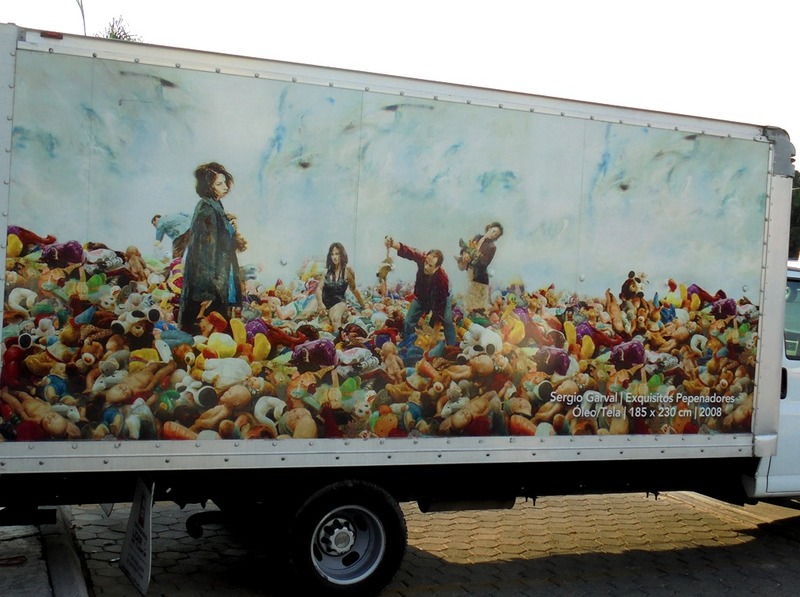 Why this famous painting is reproduced on the side of this truck, I have no idea. 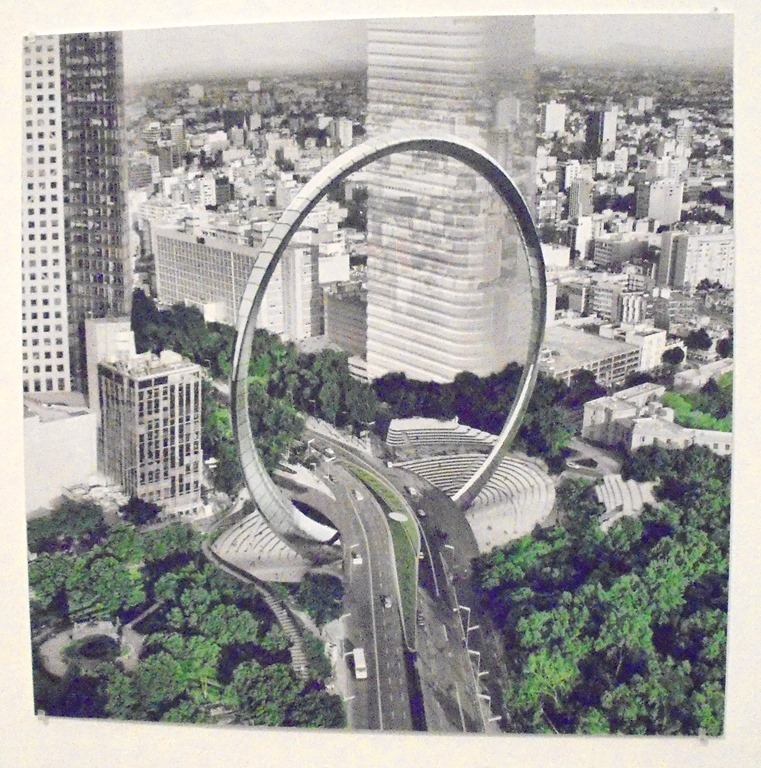 Here is a close-up of the painting (image from Global Gallery Guide). Carol and Cristina walk ahead of me. The first thing we come to is a fruit stand. Piles of good-looking fruit. 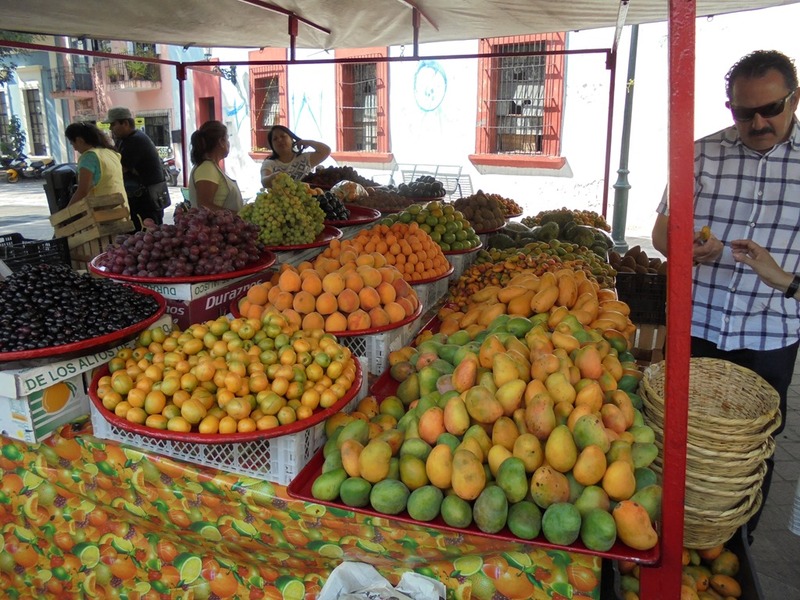 Mango season is here in Mexico now, so many luscious mangoes. 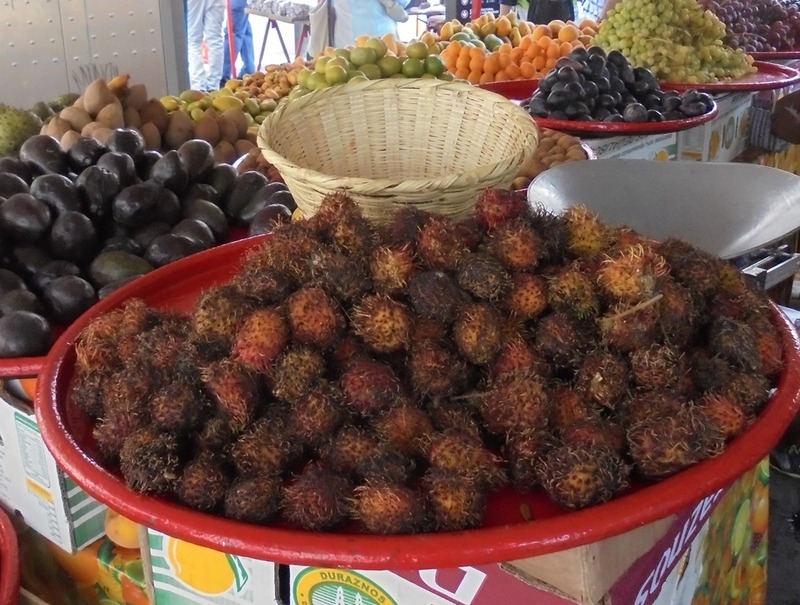 Also Mexican fruit we are not familiar with. What are these spikey things? 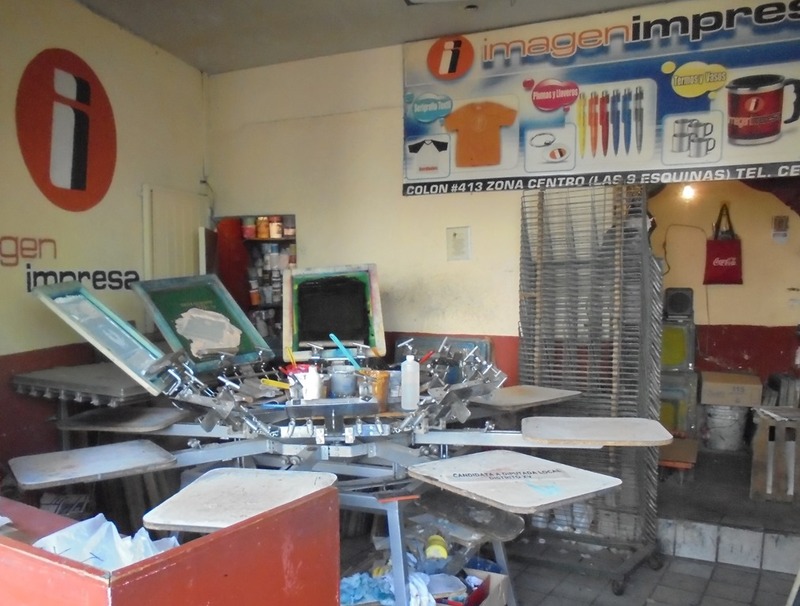 We pass by a silk screener, set up to print t-shirts on his rotating press. 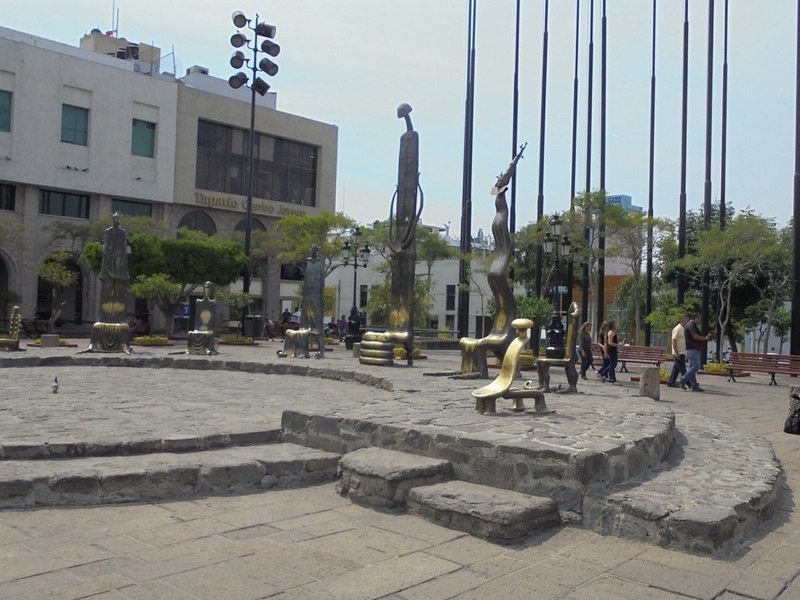 Next we come to a small plaza, The Plaza of the 9 Esquinas (corners). 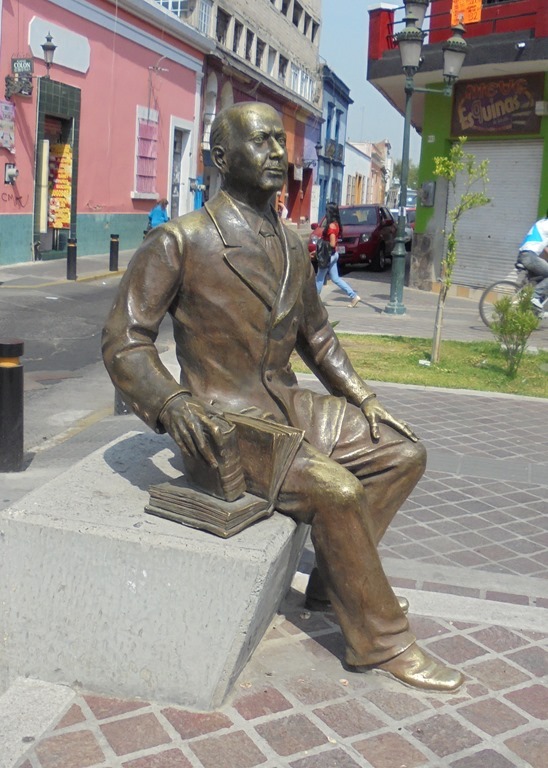 We’re greeted by one of the ever-present Guadalajara bronze statues, sitting on a bench. This spot has a along history. 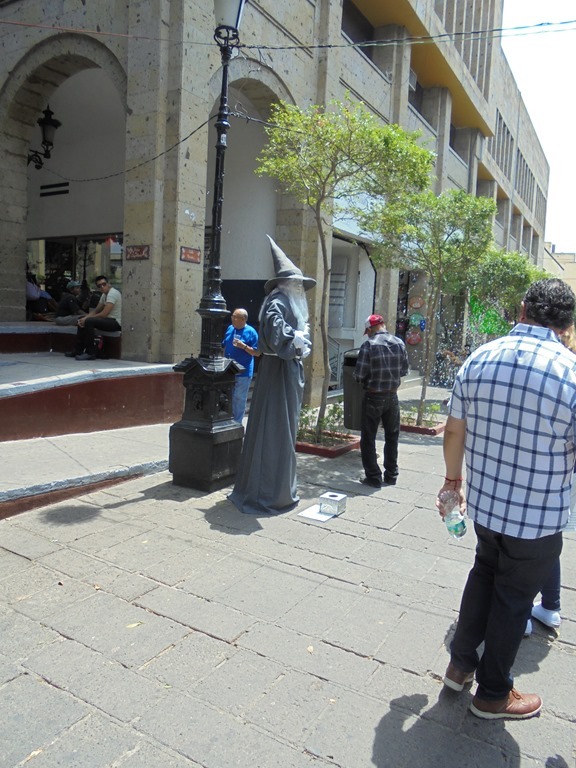 I guess that is to be expected in Centro Historico. Before there were ever streets in this area, several small streams met here. Nice houses were built on the side of the streams. Later, roads were built, and to fit the earlier pattern four streets formed somehow with nine corners (I don’t really know how). 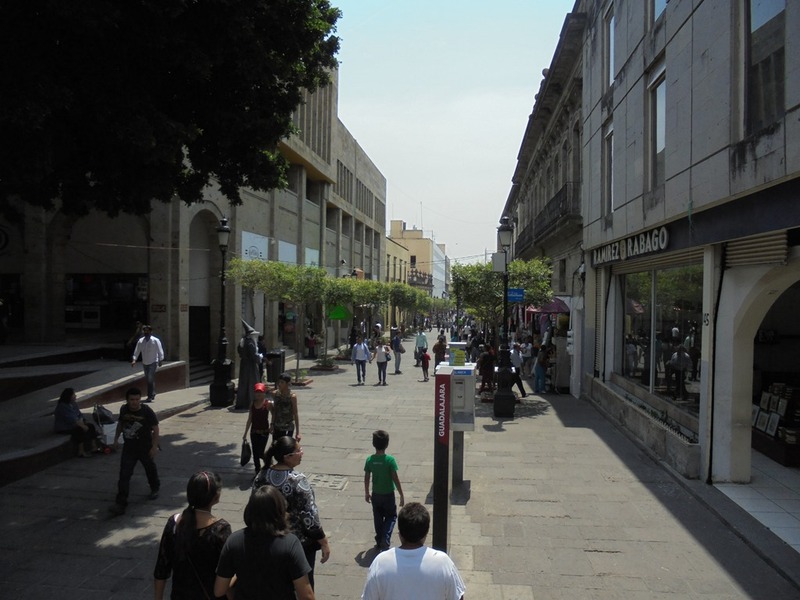 This area in central Guadalajara, near the big market, Mercado San Juan de Dios, became popular with Mariachi musicians (Mariachi originated in Jalisco state). 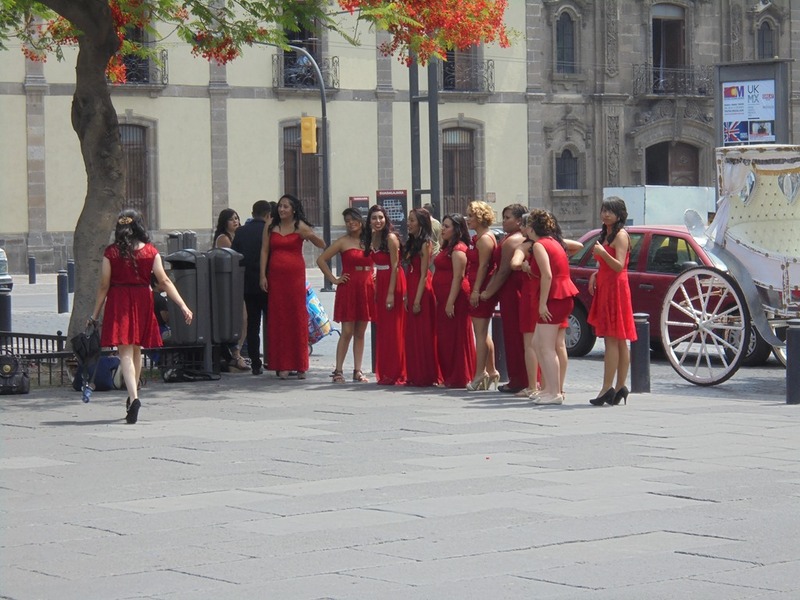 People would come and sit in the shade of the trees and pay the mariachis to serenade them with favorite songs. If it weren’t for the wolf, this is where we would greet the dawn. *The Catrina is a highly evocative symbol for a kind of female power. Specifically if refers to a native girl dressed up as a Spanish lady with a fancy hat. In the La Catrina form she is a calaca, a skeleton with a fancy hat. 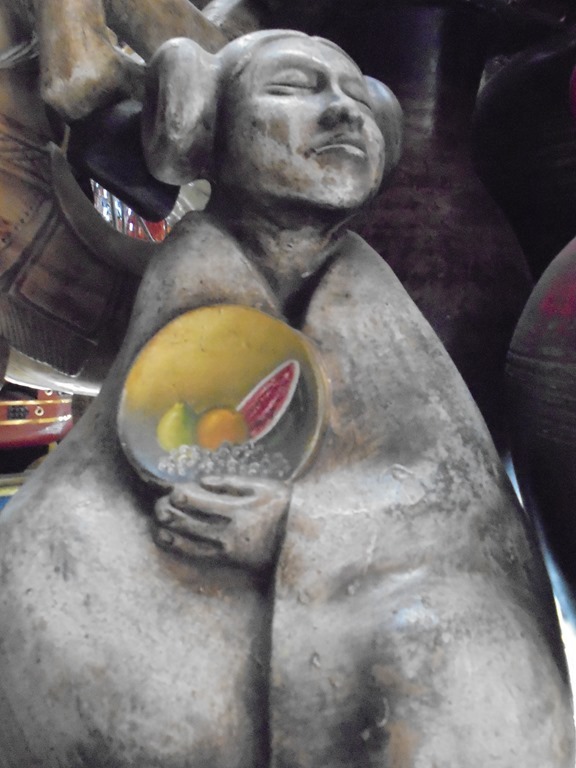 Calacas are generally depicted as joyous rather than mournful figures. They are often shown wearing festive clothing, dancing, and playing musical instruments to indicate a happy afterlife. I think the Catrina referred to in the song is a pretty young girl, not the calaca. Now we can see the square, lined with trees. 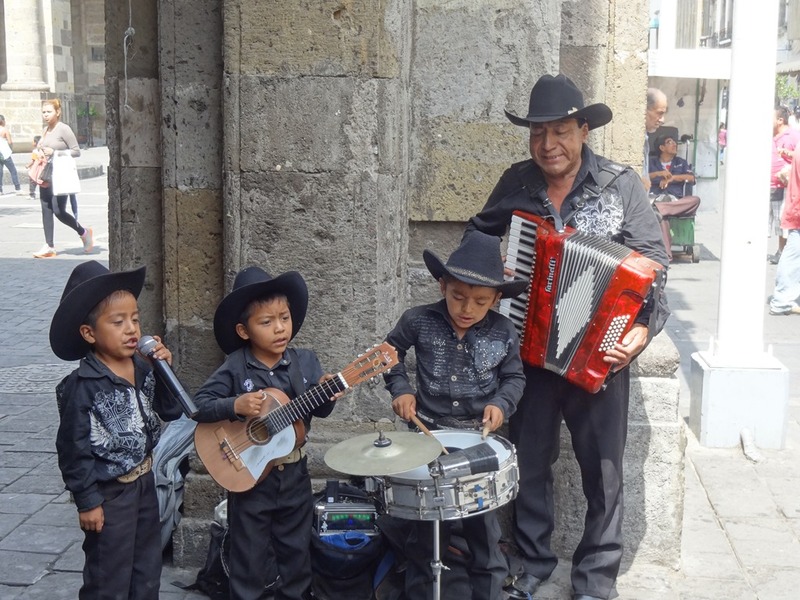 I wonder if sometimes Mariachis still come to play here? Next we walked a few blocks through the city. 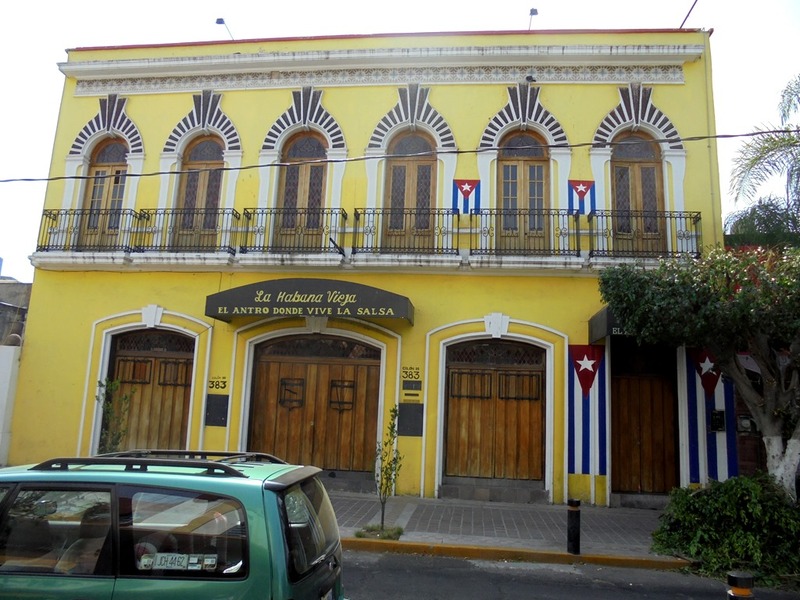 Here is a nicely decorated building that houses La Habana Vieja, a high-class wine bar. 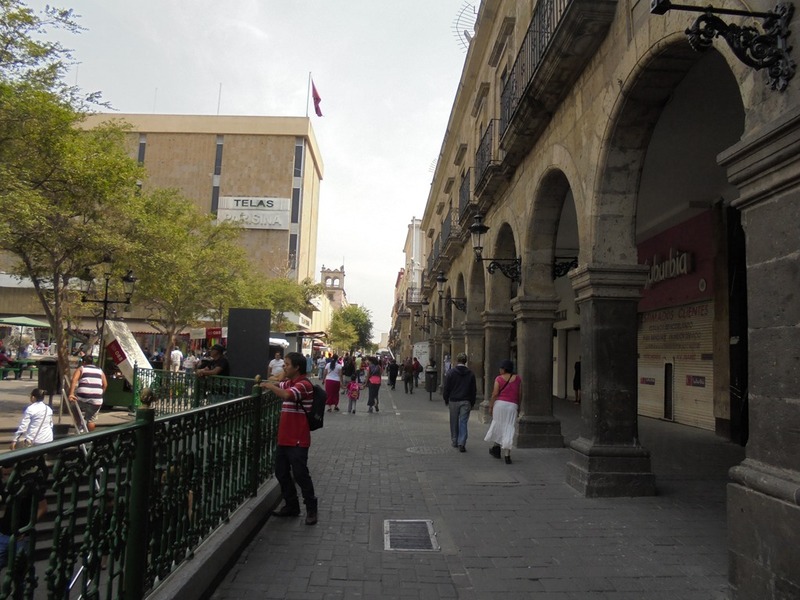 As we get more into the center of the city, many old massive buildings line the streets. This one with its cupola looks like some kind of governmental building maybe. Does anyone know more? 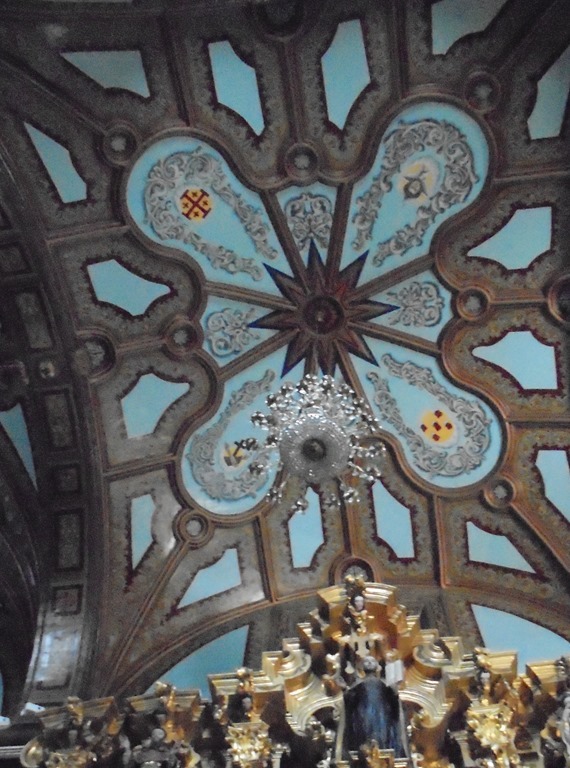 Next on our tour is an old church, the Temple of Our Lady of Aránzazu. Aránzazu is the name of a form of the Virgin Mary that appeared in the Basque region of Spain. 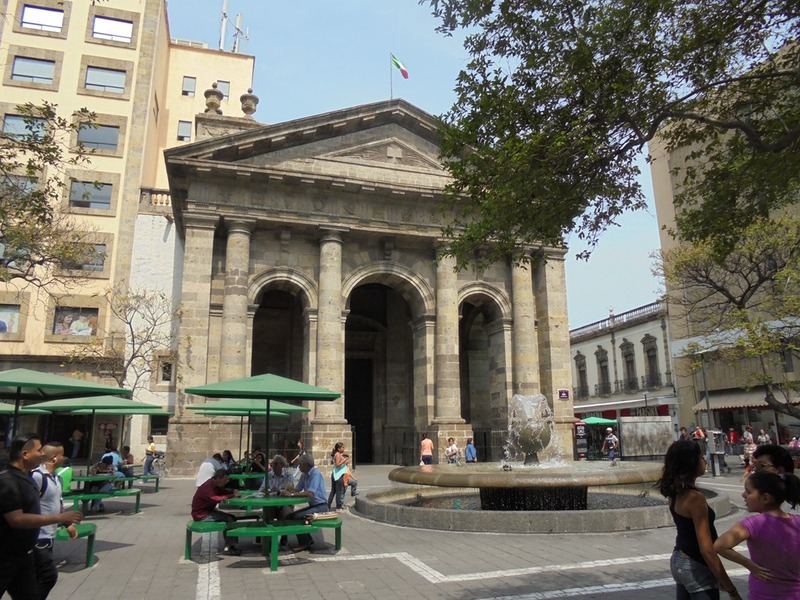 This is the only 18th century church in Guadalajara, built between 1749 and 1752 as part of a group of buildings centered on the nearby convent of San Francisco, with five surrounding chapels. 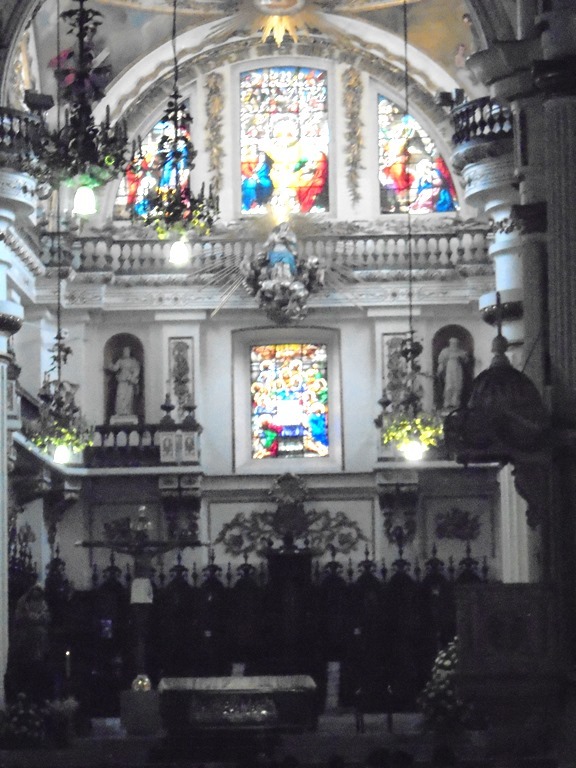 Our Lady of Aránzazu is one of these chapels. 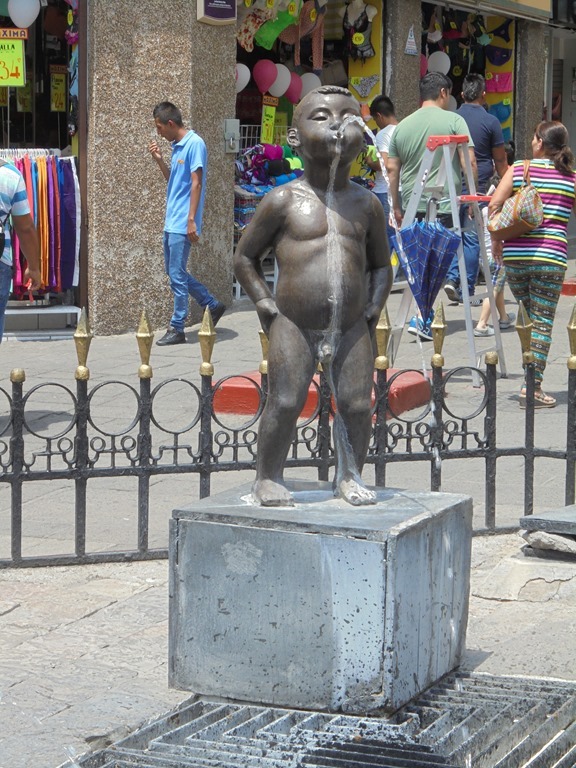 Now there is a statue of him in Guadalajara. Below, the front of the church. We are standing in front of it, like good tourists for our photo. 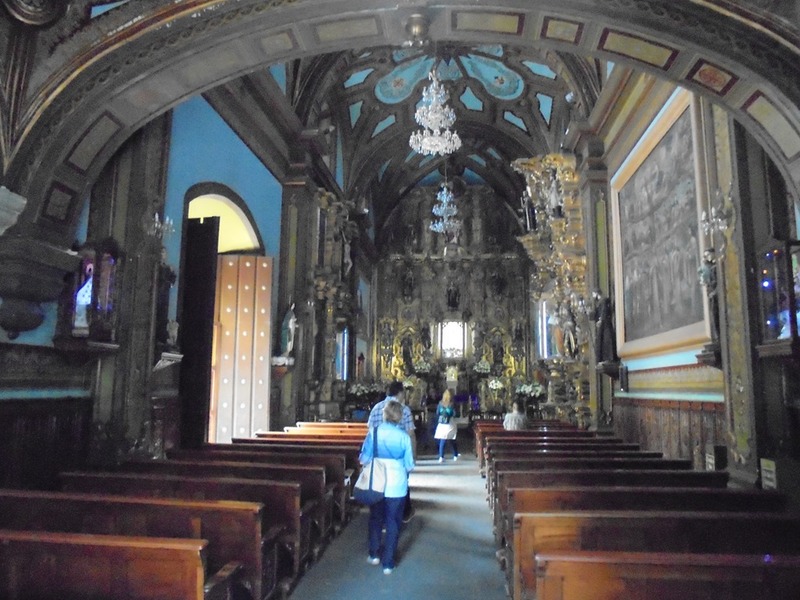 A special feature of this church are beautiful churrigueresque style (Spanish Baroque style popular in the 1700s) altarpieces made of carved wood. 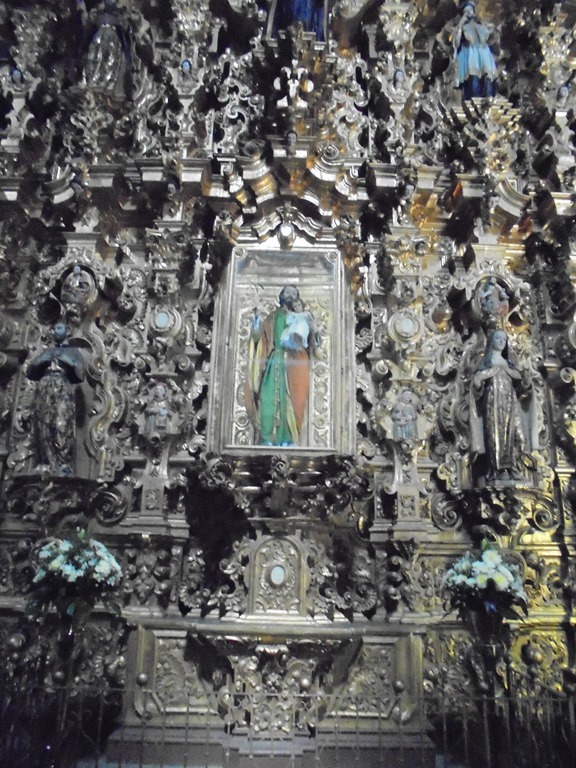 This altar represents the San Francisco de Asís Doctrinal Tree, surrounded by kings and queens that had adopted it. Another view of Our Lady of Aránzazu, through the plaza that surrounds it. 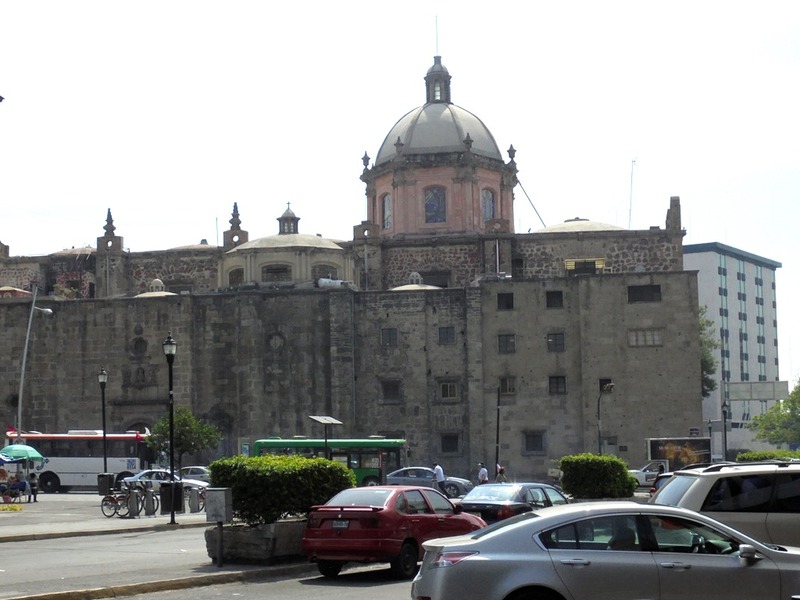 Below is the Templo de San Francisco de Asis, the main building of the complex. We did not go in to it. Another time. Walking the the streets. More old buildings. What history is here? 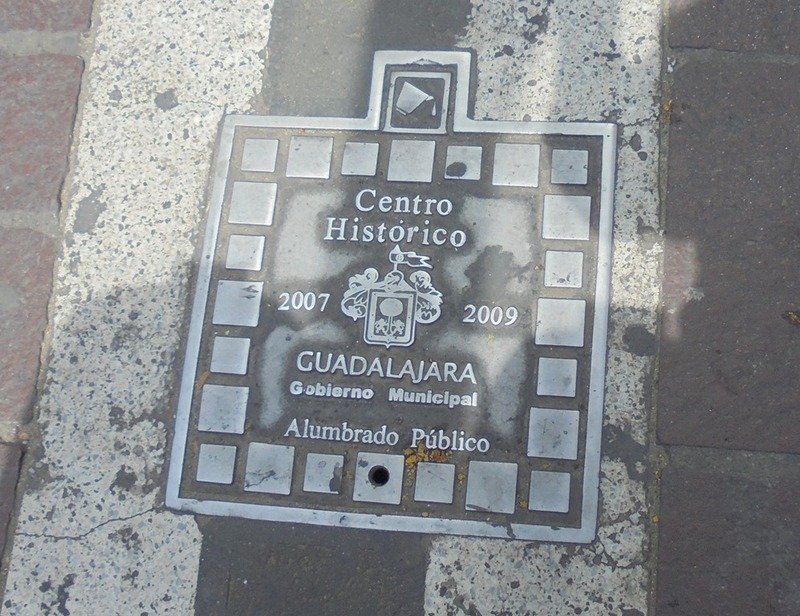 All through the area there are plaques in the sidewalk, celebrating a Centro Historico celebration in 2007 –2009. I think these are access plates to access what is built in to sidewalk, like water controls. 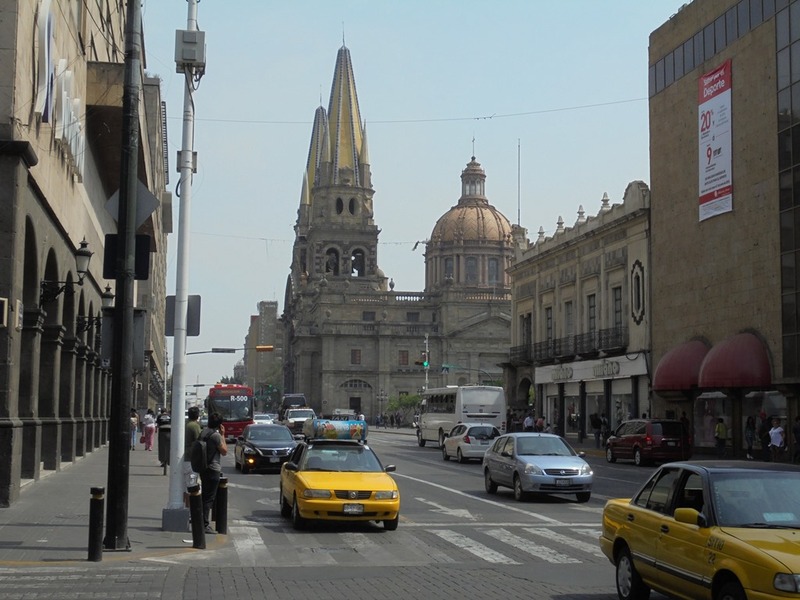 The Cathedral of Guadalajara looms ahead. Below, another old building. I love the archways along the street level, common building features in this district. 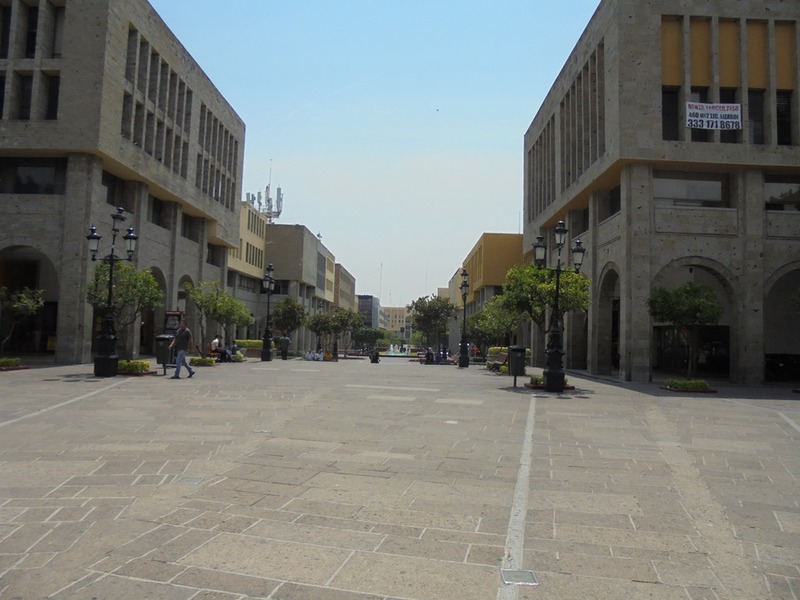 We pass through another plaza, this one dedicated the University of Guadalajara, whose old main building lies ahead. The University has a long history. Its antecedent was the St. Thomas College, founded in 1591 by the Jesuits. 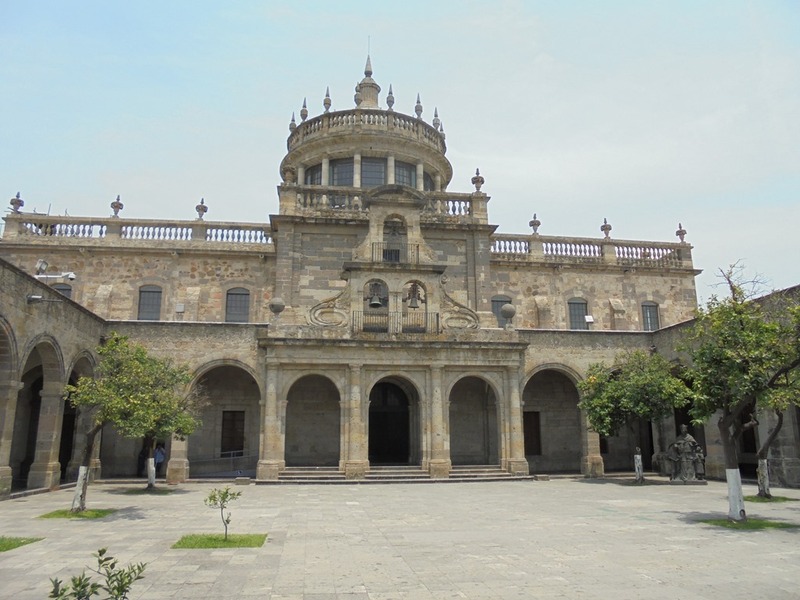 Then in 1791 King Carlos IV of Spain authorized the creation of the Real y Literaria Universidad de Guadalajara, a university similar to that in Salamanca in Spain, teaching Law and Medicine. 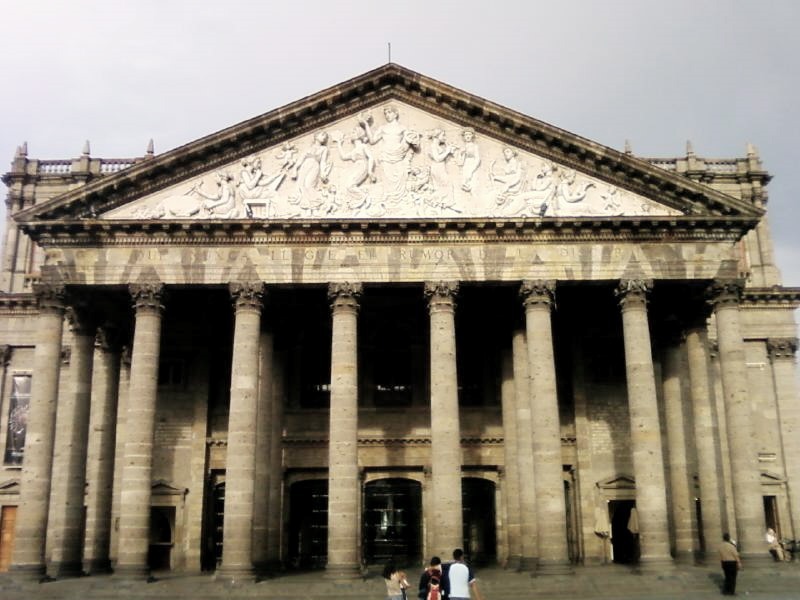 From 1826 to 1860, due to the constant conflict between conservative and liberal governments in the young Mexican Republic, the University was closed and reopened several times, and renamed “Instituto de Ciencias del Estado” or “Universidad de Guadalajara” depending on which side was in power. 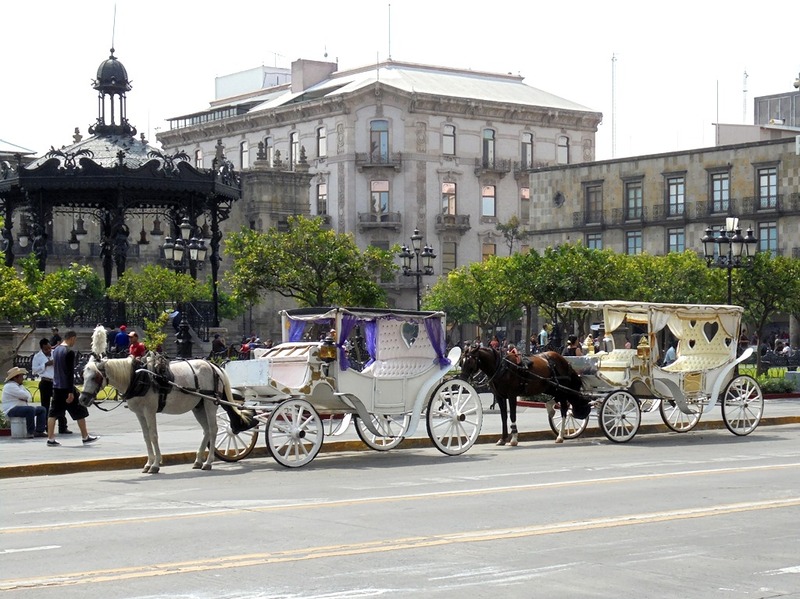 During 1860 to 1925 control passed to the state of Jalisco. 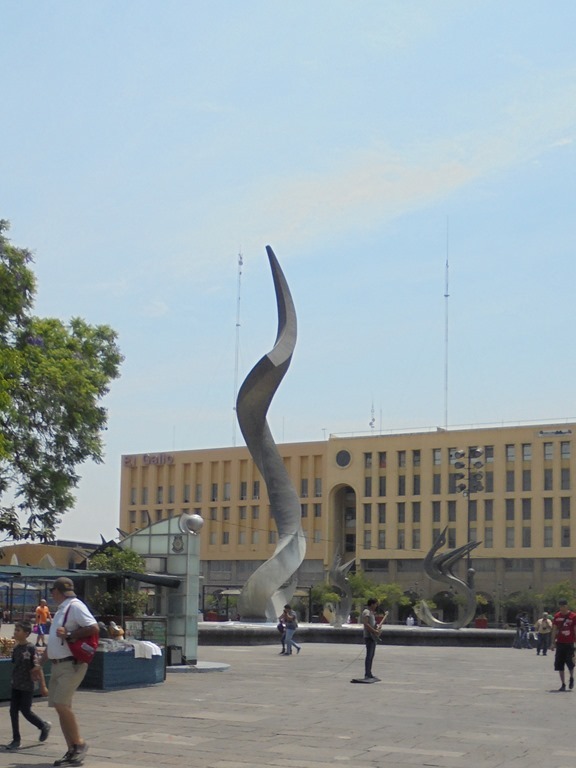 In 1925 the present University of Guadalajara was founded. 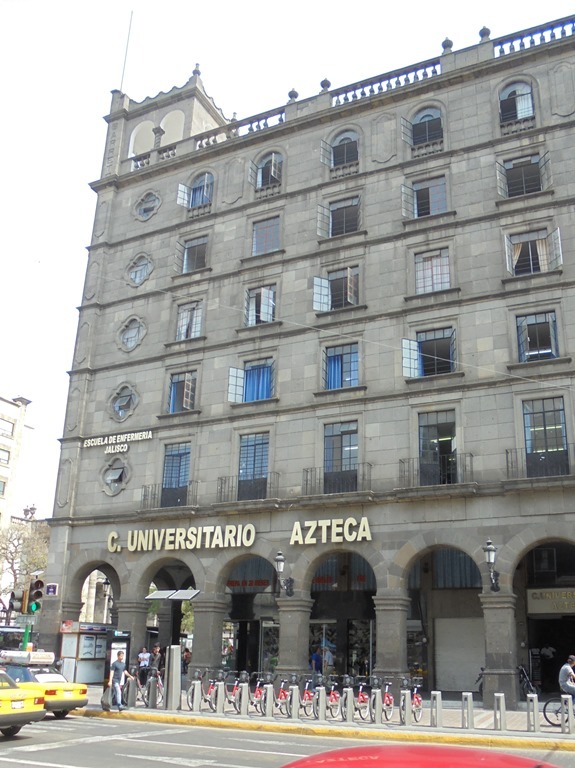 In 1989 it took its present form as La Red Universitaria de Jalisco, the The University Network of Jalisco. This was the main building for the University for a long time. I don’t know when it was built, but I saw a picture of it dated 1886. 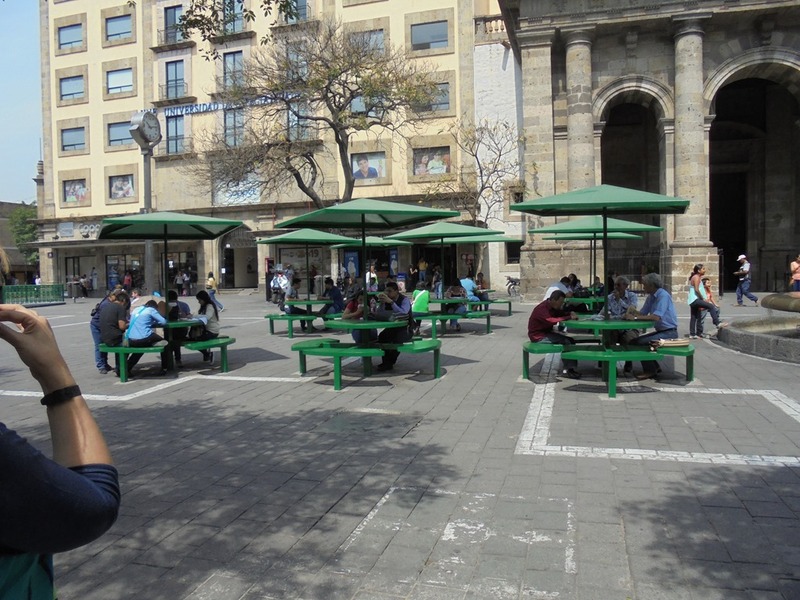 This plaza was also known as the Plaza de las Sombrillas, “Plaza of the Parasols, and is known as a place to relax. A fountain (one of many we will see today) is in front of the building. As we walk along we see three small boys and (probably) their father. The boys sing and play instruments for donations. We walk past another long arched walkway. 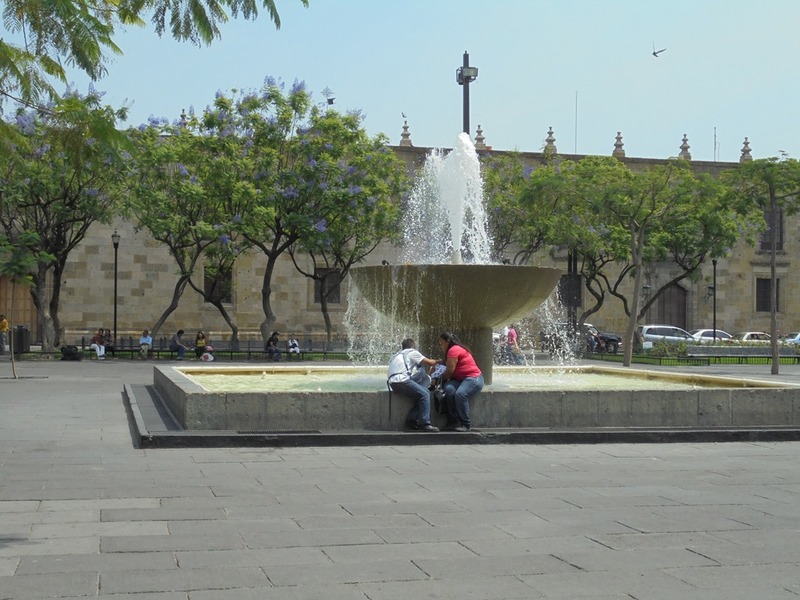 On the far side of the Plaza is the Guadalajara Cathedral. As with other buildings, there is much history behind this place. 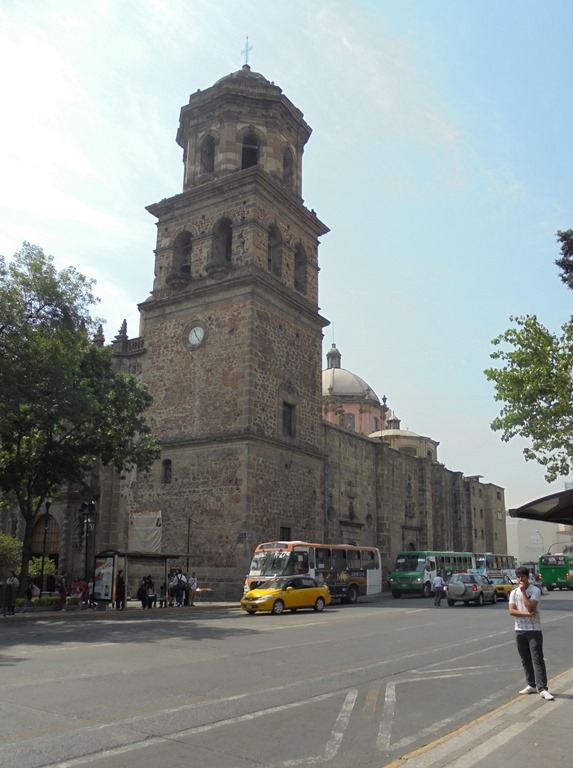 The cathedral has several names: Guadalajara Cathedral, or Cathedral of the Assumption of Our Lady, in Spanish, Catedral de Guadalajara or Catedral de la Asunción de María Santísima. 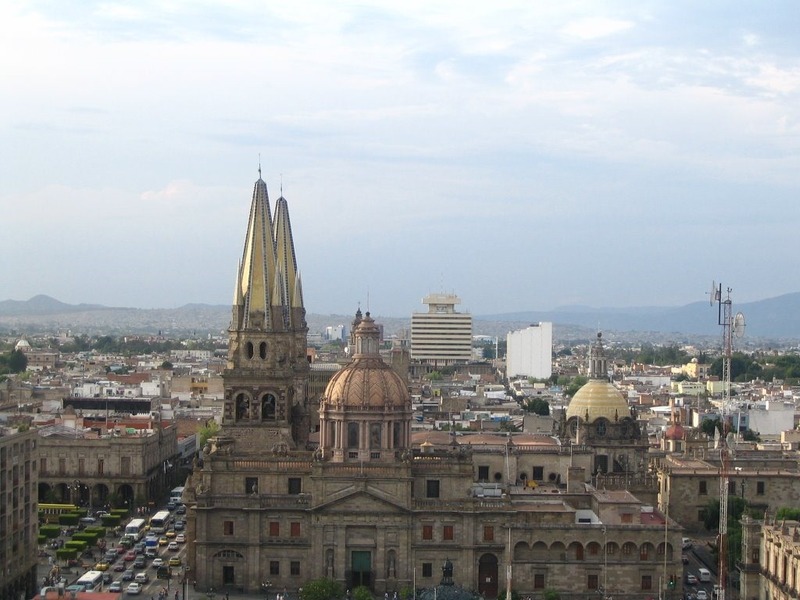 Guadalajara was founded in 1542. 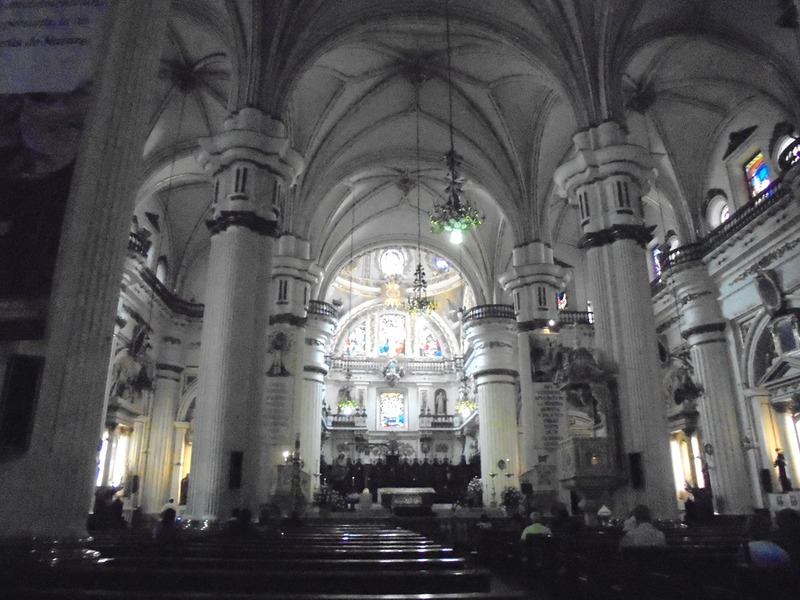 So was the first parish, the El Sagrario Metropolitano de Guadalajara, the oldest parish in the Diocese. “Before the Cathedral there was the parish” it is said of the Cathedral. 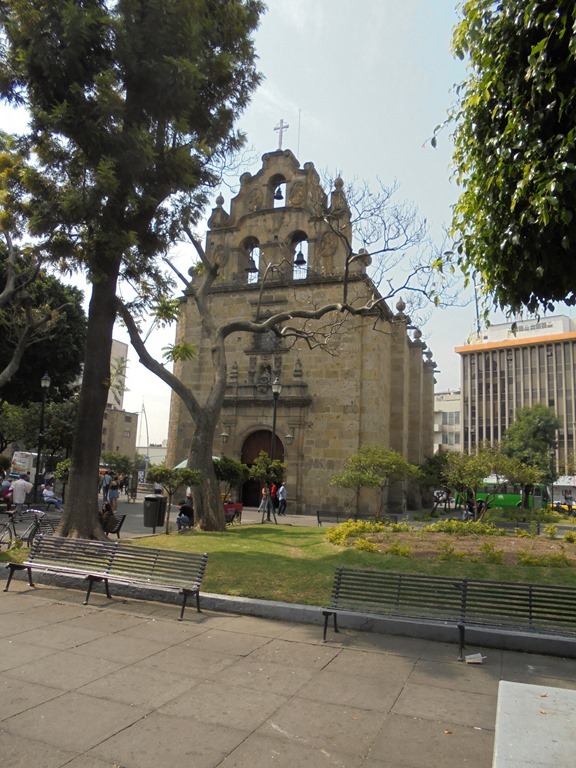 The city and parish were founded at basically the same time, because in early Mexico the Spanish conquerors and the Catholic Church moved together. Even in the original Fernando Cortes expedition, he had a friar and a priest along with him. The Spanish (and Portuguese) were granted special rights by the Pope to help him carry out his mission of converting the population of the New World to Catholicism. So it was the task of Cortes, by order of the Spanish King Philip II, to carry this out. 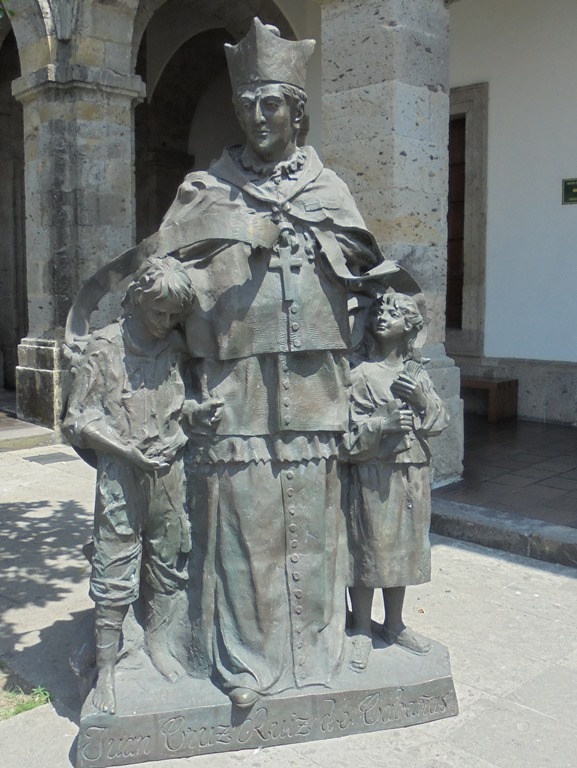 After Cortes had his early success over Montezuma, he asked that the Franciscans, the Dominicans and Augustinians, all orders of mendicant friars, to help him subjugate Mexico. 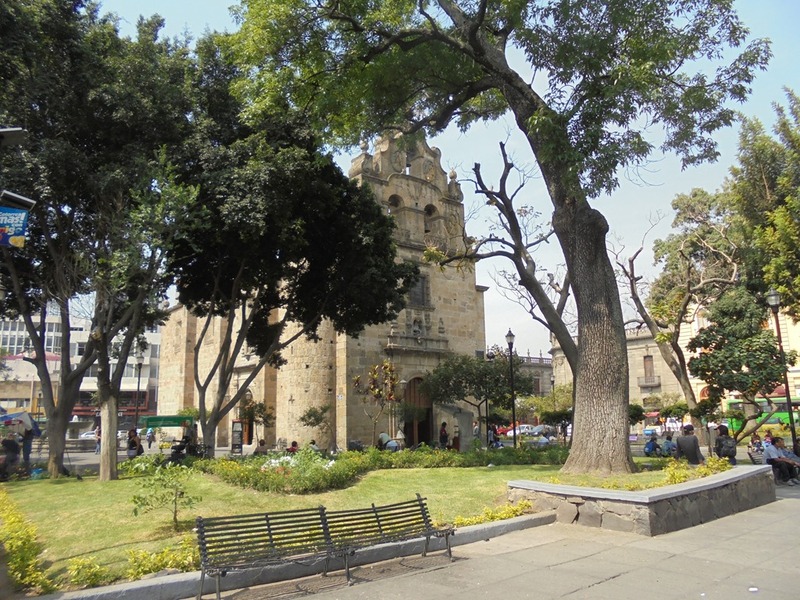 The first Guadalajara church was built in 1542. This primitive church was built with adobe and a thatched roof. 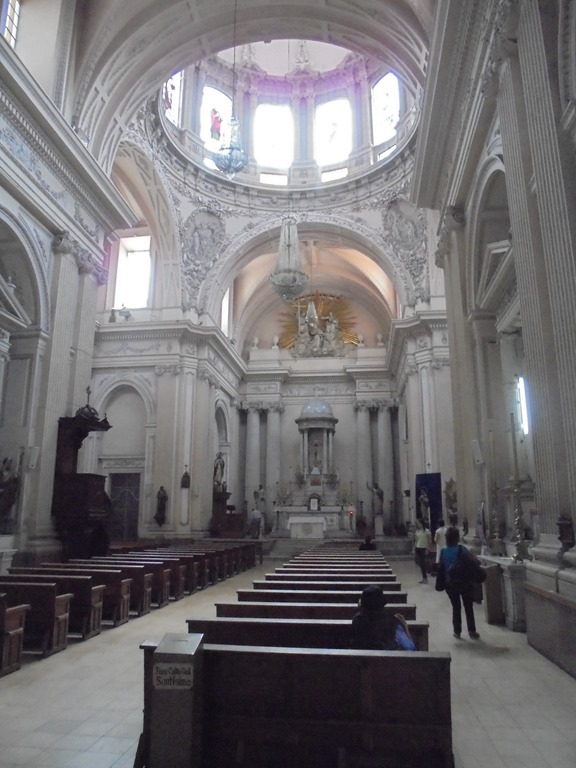 in 1548 the region was declared a Diocese by the Holy See in Rome and this church became the cathedral of the city. On May 30, 1574, during mass, neighbors fired celebratory shots into the air. 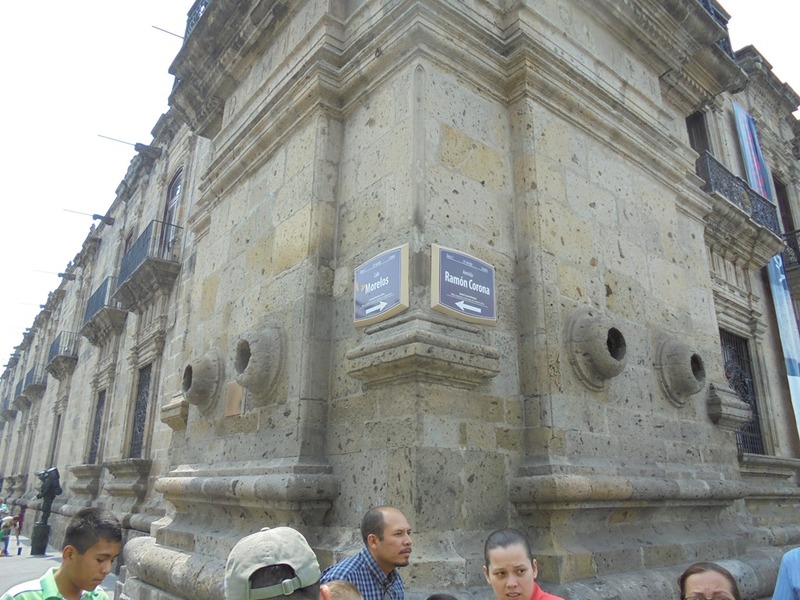 Some of the bullets fell onto the cathedral and started a fire, destroying the building. Work began quickly on a new cathedral, but due to difficulties, was not completed until 1618. Earthquakes in 1818 and 1849, destroyed the towers and dome both times. 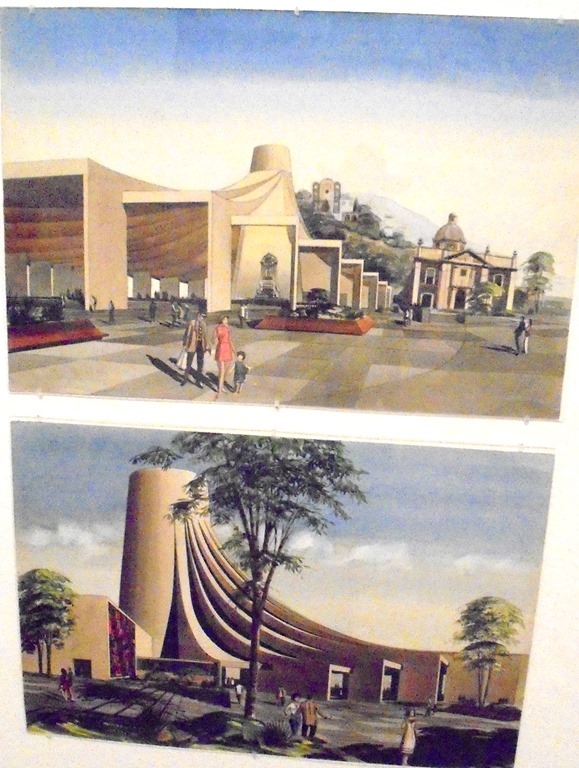 New towers were designed by architect Manuel Gomez Ibarra. The new structures were completed in 1854. Pope Pius XII elevated the cathedral to the rank of Minor Basilica. 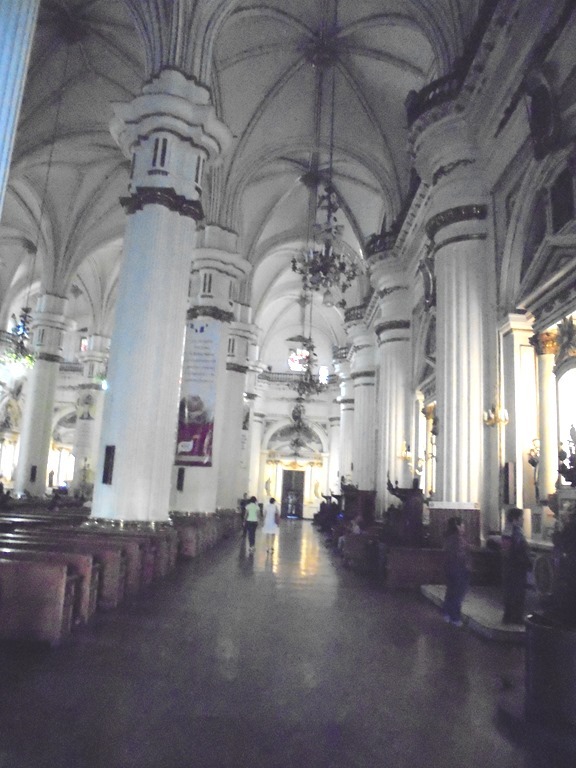 The cathedral continues to be in danger: it was damaged by earthquakes in 1932, 1957, 1979, 1985, 1995 and again in 2003. We are back on the street now. Walking past more old buildings. We are on the corner of Moreles and Ramon Corona. 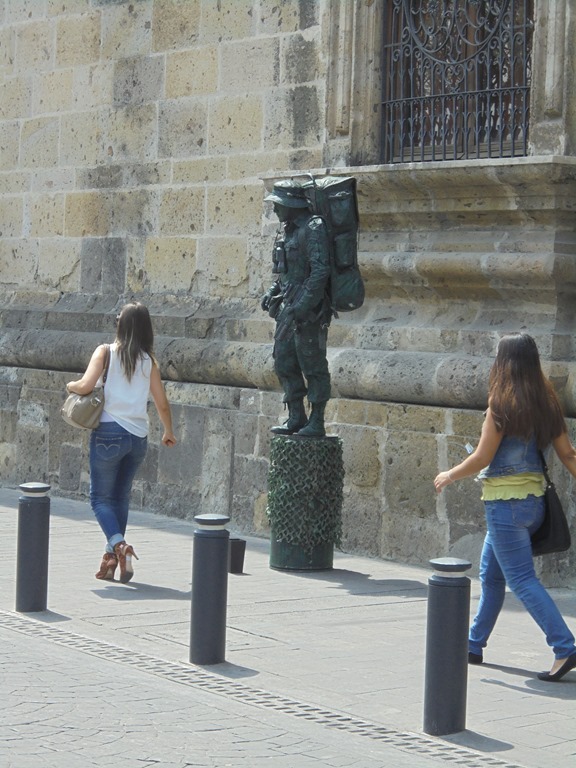 Nearing Plaza de la Liberación, “Liberation Square,” we saw what looks like a statue of a soldier. 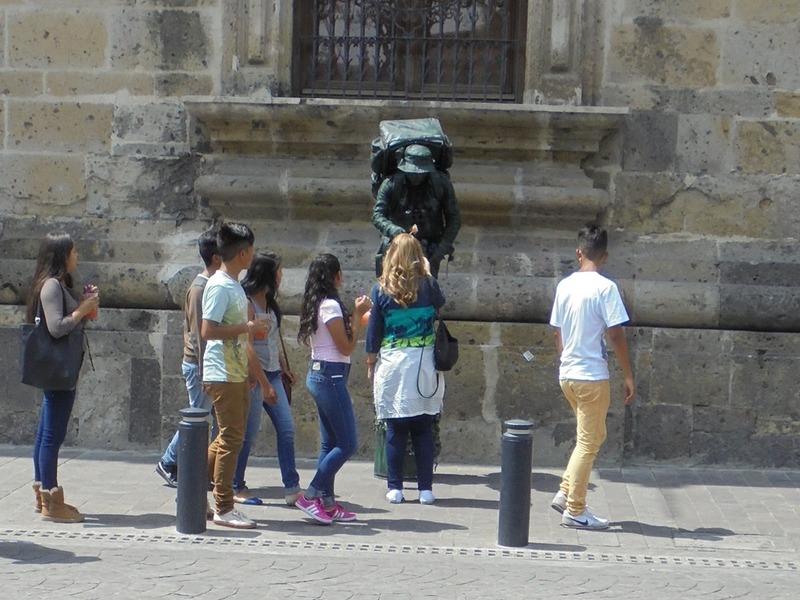 But then, as people neared, the statue started interacting with them. 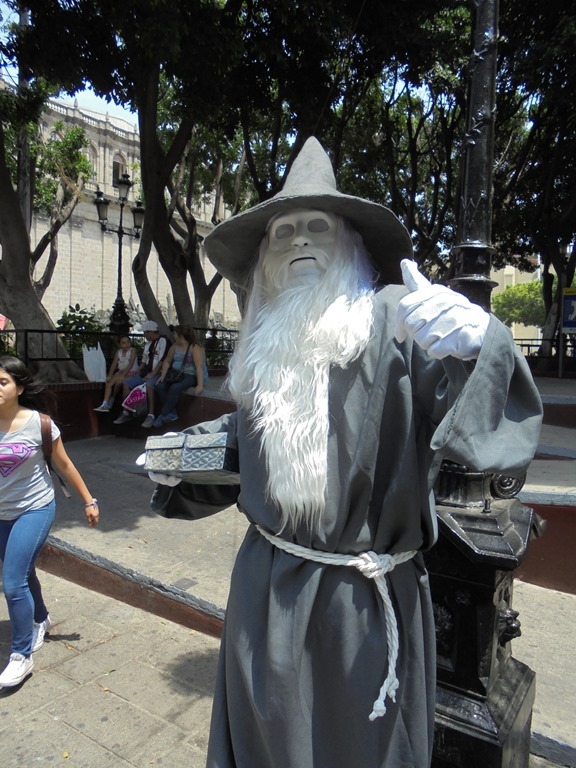 I had forgotten that in Guadalajara there seem to be many street artists, like the jugglers we have seen when stopped at street lights. The “statue” is yet another. 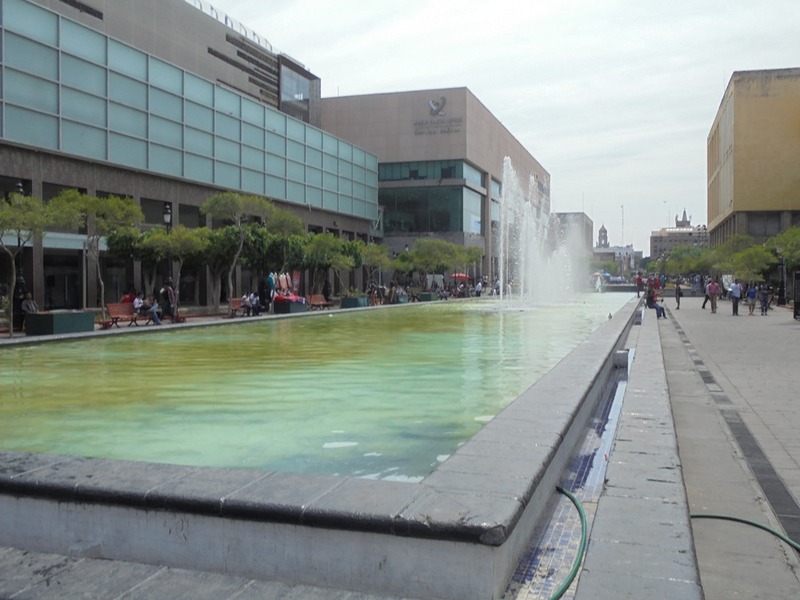 Liberation Square has long been a gathering place in Guadalajara. 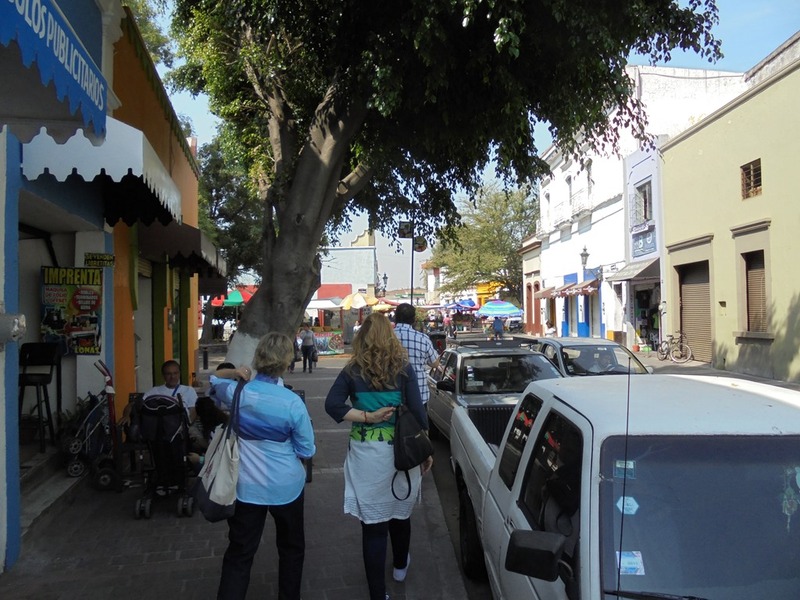 Soon after the city was founded this area was a “flea market” for the region with small vendors selling food, arts and crafts, and clothing. Public use of this land has continued to this day. 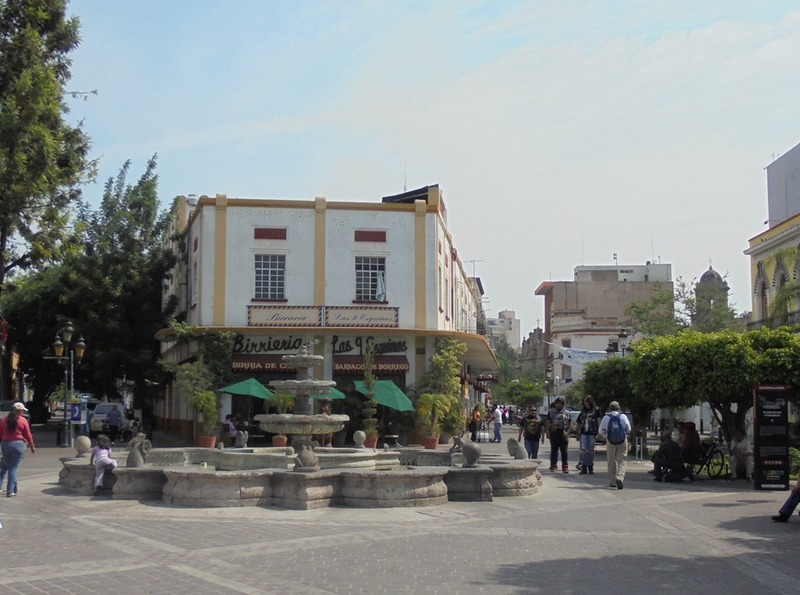 The plaza is surrounded by important Guadalajara buildings. 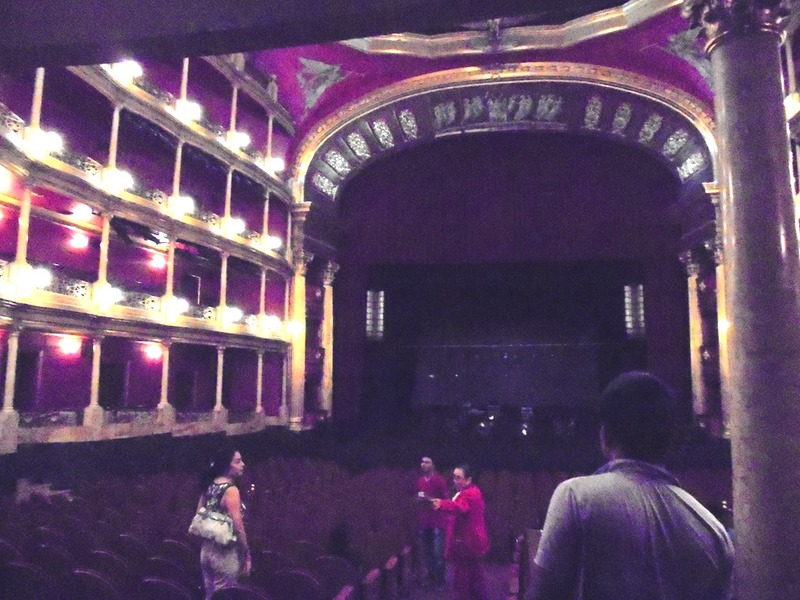 The Teatro Degollado is shown here. 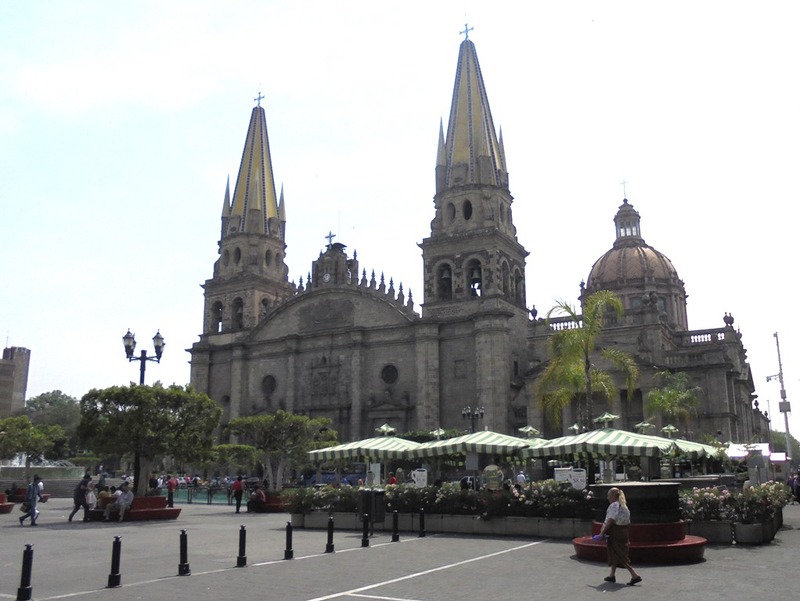 The Guadalajara Cathedral, from the back side. Galería de Juristas y Legisladores. I know that the Legislative Palace is one of the important building that look out on the square. This is certainly an old and important building. 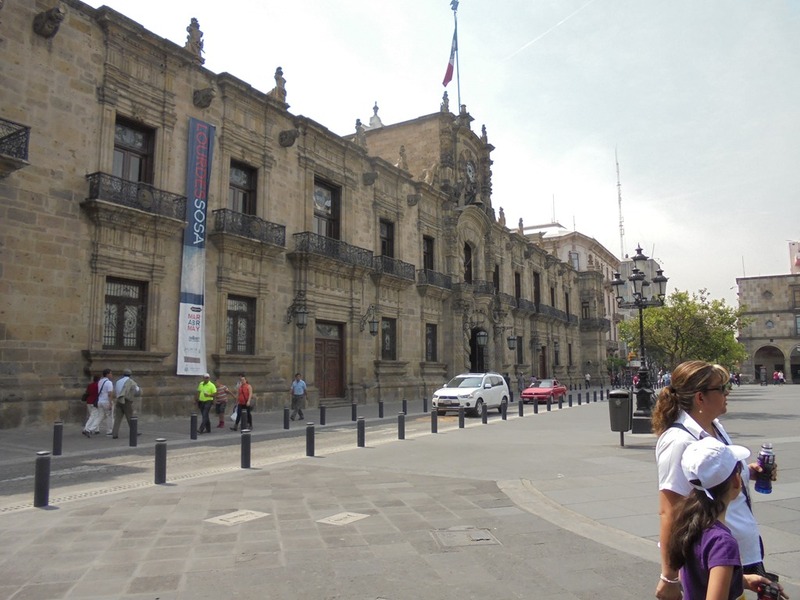 The two important buildings that face the square, not pictured here, are the Regional Museum and the Government Palace. 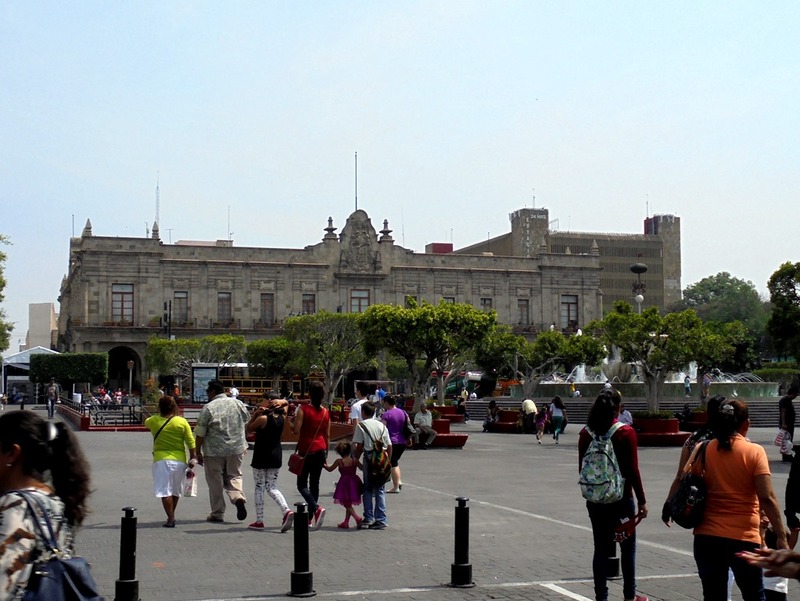 The Government Palace is a significant location for the Mexican War for Independence from Spain in 1810. 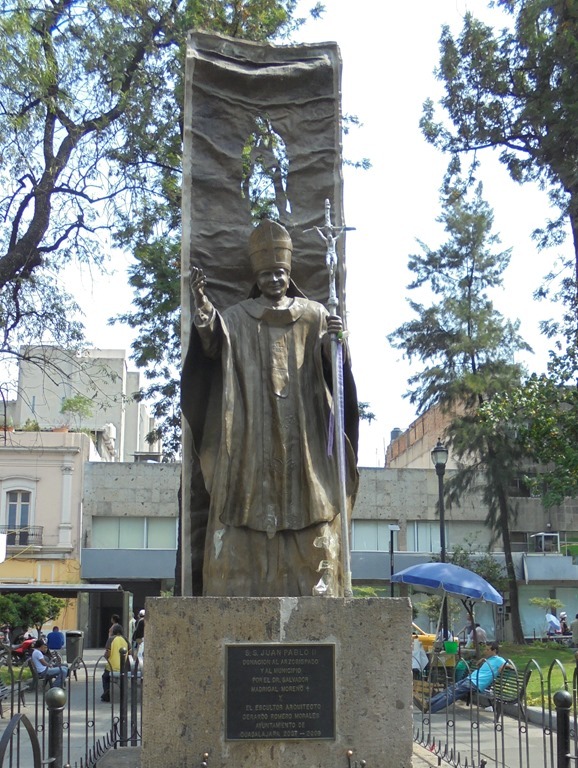 Its original leader was a Catholic priest with advanced ideas, Miguel Hidalgo y Costilla, known just as Miguel Hidalgo. 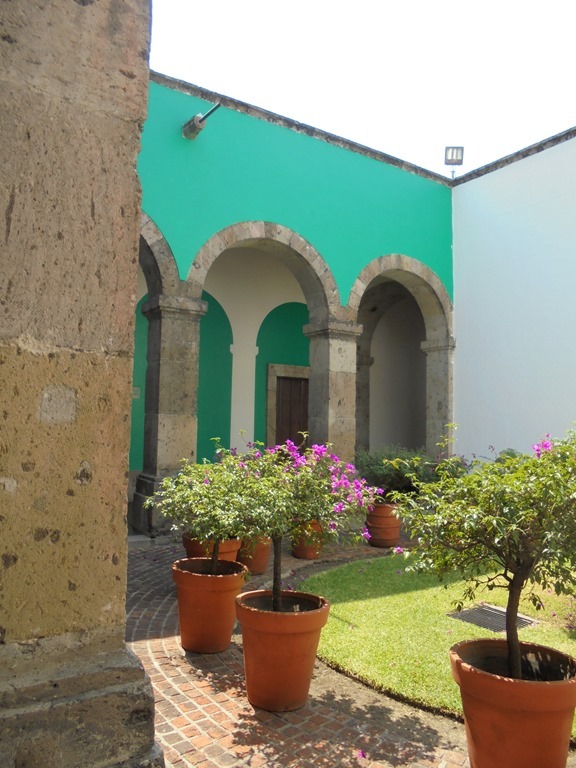 In 1810, in the early days of the revolution, from this palace, Father Hidalgo established the law abolishing slavery in Mexico. 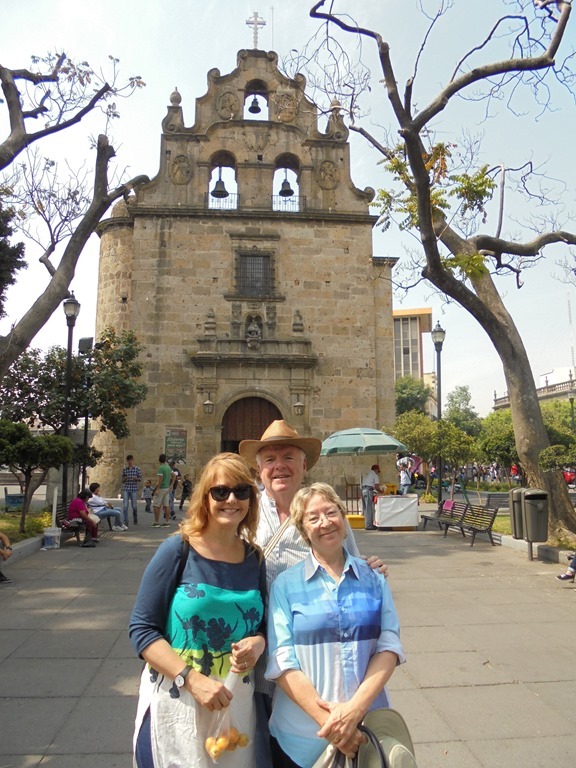 Next time we visit the Centro Historico district will try to find the buildings that we missed this trip. 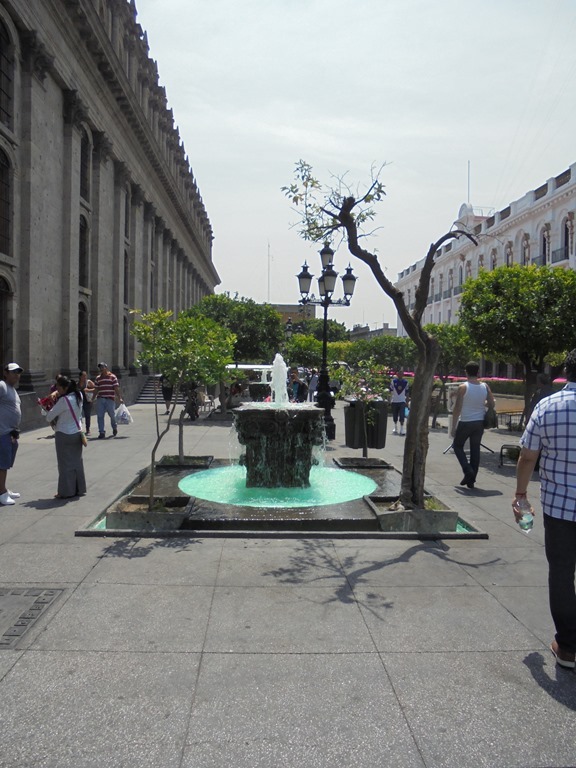 Naturally there is a fountain in the center of the plaza. At one end of the square we see some activity with lots of people gathered. It is surely a school graduation. 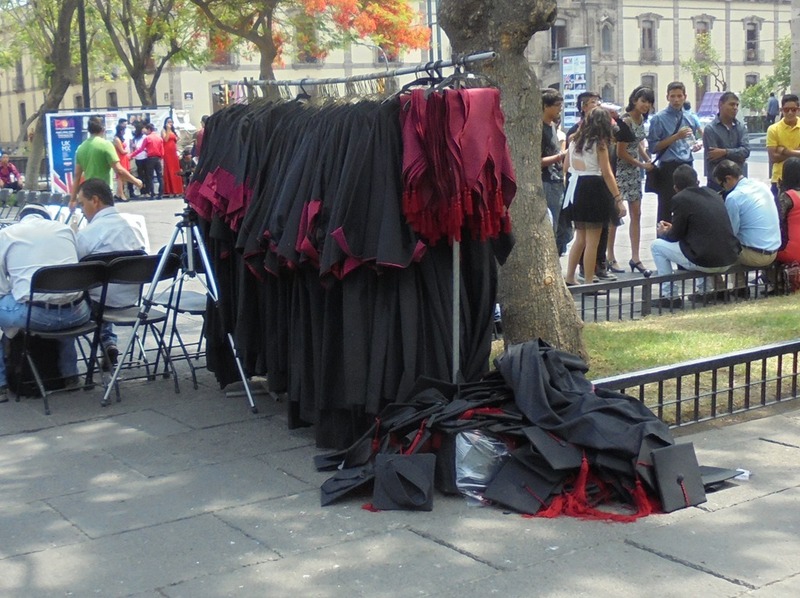 From the caps and gowns, probably a college graduation event. There is a group of similarly gowned young women. Here posing for a group photograph. 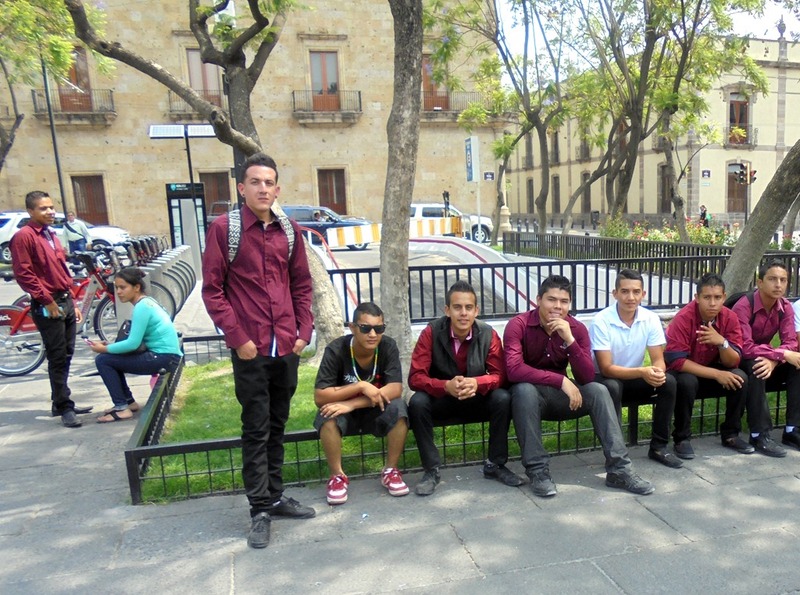 Some young men sitting nearby, surely part of the group, given their similar clothes. Others walk through. Though the women are well dressed, I don’t think they are part of the graduation group. The theater lobby, with a big glass chandelier. Cristina is walking in the lovely light-space below. She told us that usually the theater is closed to visitors during daytime, so we were very lucky to be able to take a look inside. Inside the theatre. Boxes for wealthy patrons line the walls, going up four levels on both sides. 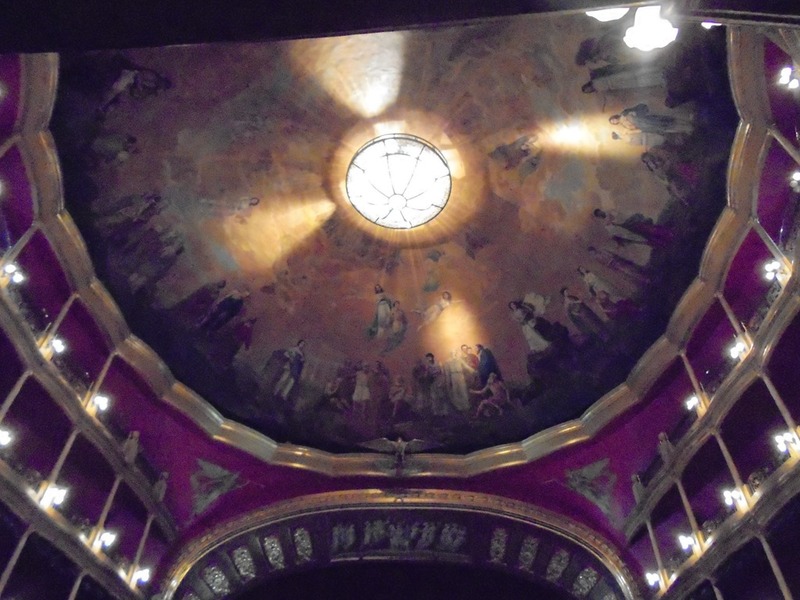 The ceiling, with lights and a painting. As we continue our walk we come to several blocks where there is no traffic, just walkers. 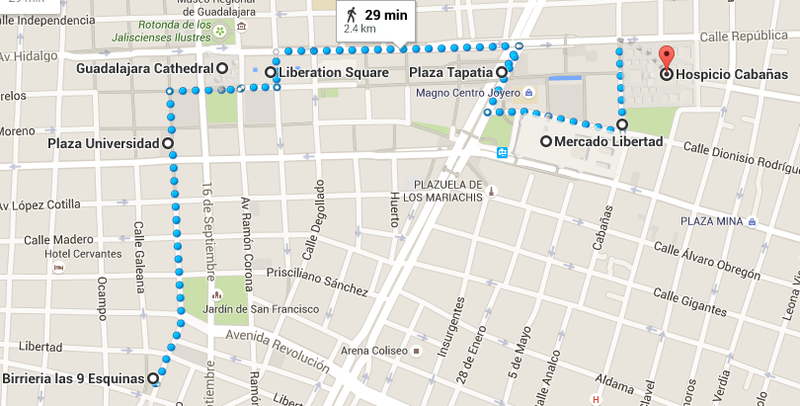 We are walking east on Calle de Moreles. We pass by some urban art that I liked. 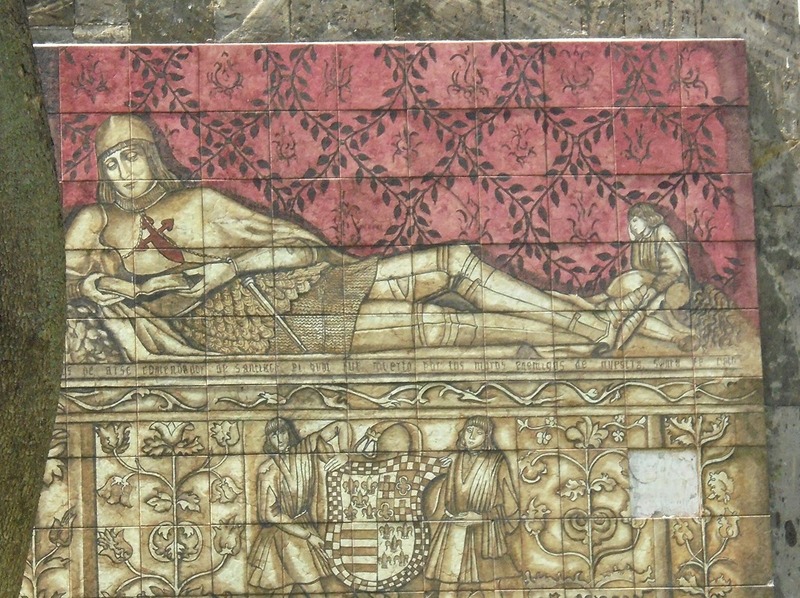 Here is a ceramic mural of a reclining man, maybe royalty, because of the heraldry, held by two men below. The clothes are surely very old style. Anyone know who this is? Here is another image that is from the past. An older man with some hat or headgear, displaying a letter or a signed document, rendered in a pretty contemporary style. If I had to guess I would say that it is Miguel Hidalgo holding his ban on slavery. 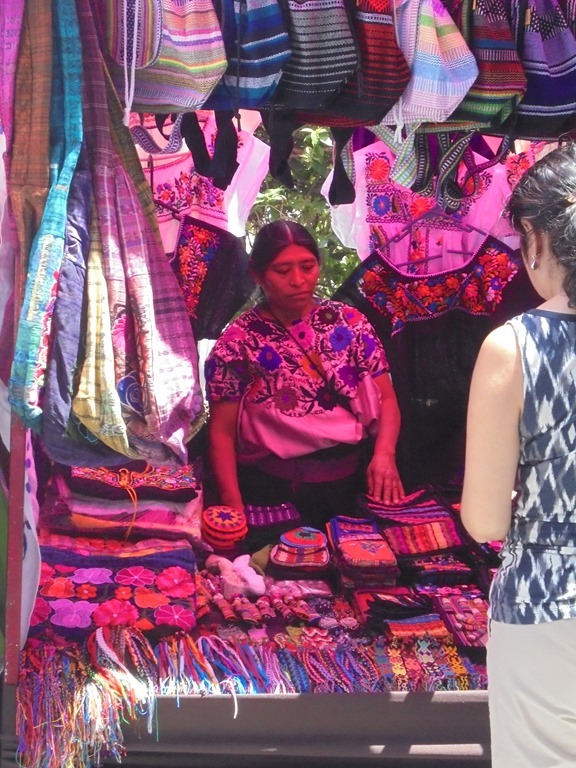 The wide street has space for vendor stalls with women’s clothes (many made in India! ), jewelry, etc. The light turned the woman below a deep pink. A statue of a man from the 1500s, not a warrior or priest (all these guessed by his clothes). Who is he? The view east on the street. Not too much foot traffic today. 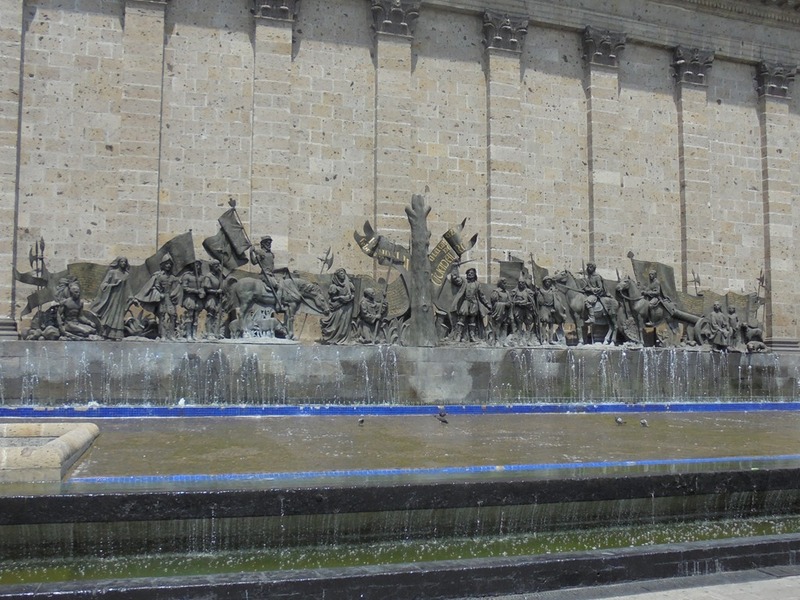 The Founders Plaza marks the spot where Guadalajara was founded on February 14, 1542. 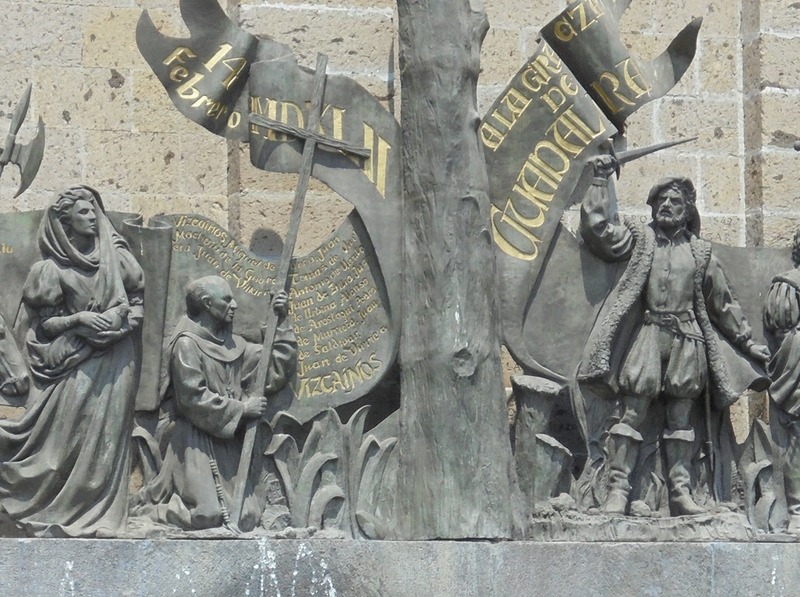 Don Cristobal de Oñate (Acting Governor New Galicia), Don Antonio de Mendoza (Viceroy of New Spain), Doña Beatriz Hernandez (a Spanish woman who helped get people to agree to the settlement), and Fray Antonio de Segovia are in the center of the frieze. On both sides are groups that helped Spanish colonization: Andalusians, Castilians, Basques, and local Indian natives who had been helping these European setters. The center of the frieze is a tree that is also the center of the story. 63 European families that formed the local population at that time wanted to settle in a city, but were afraid of doing so here because of previous problems. 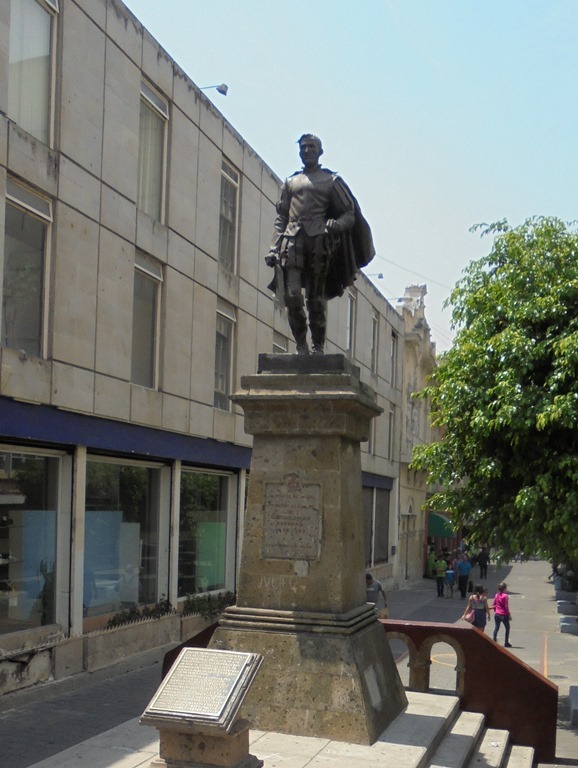 They say that the people were protesting when Mr. Oñate took out his knife and plunged it into the trunk of a tree that was in front of him and that was how the city of Guadalajara was founded, on behalf of the king. Still the people were complaining and nobody agreed with settling down in this place. So, Doña Beatriz stood up behind Mr. Oñate, with a rooster in her arms, and started to shout until the people got quiet and then she said: “People, we are staying here, the king is my rooster (gallo), and we are staying here for good or bad!” A moment later she heard applause and cheers of joy. All accepted the chosen location. I love these urban groves along this walk. 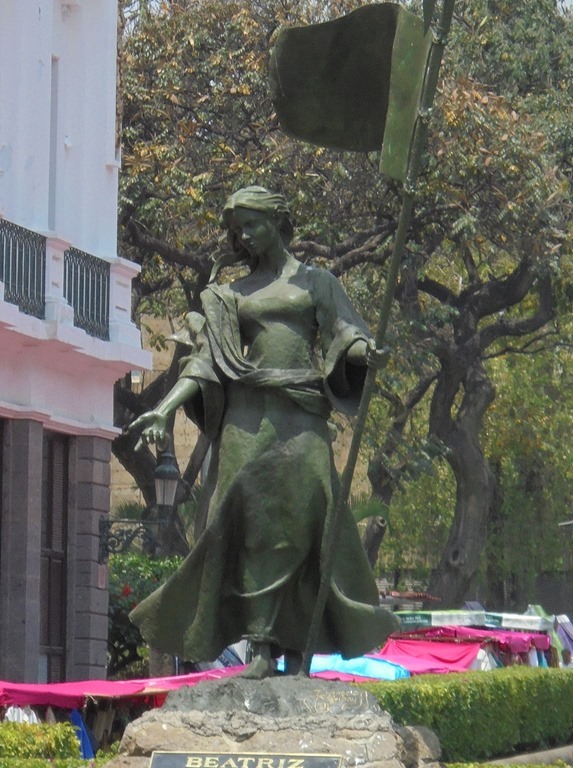 Here is a statue of Doña Beatriz Hernandez. Where’s her gallo? Next we see Merlin the Magician. What a good outfit! I should have asked him to make magic (but I didn’t). In the middle of the crowd there is a bronze tree that rises up. It is the coat of arms of the City of Guadalajara. We come onto another singer, this one a young girl belting out a song with her father’s accompaniment. Then another fountain. This is the famous Fountain of Children. 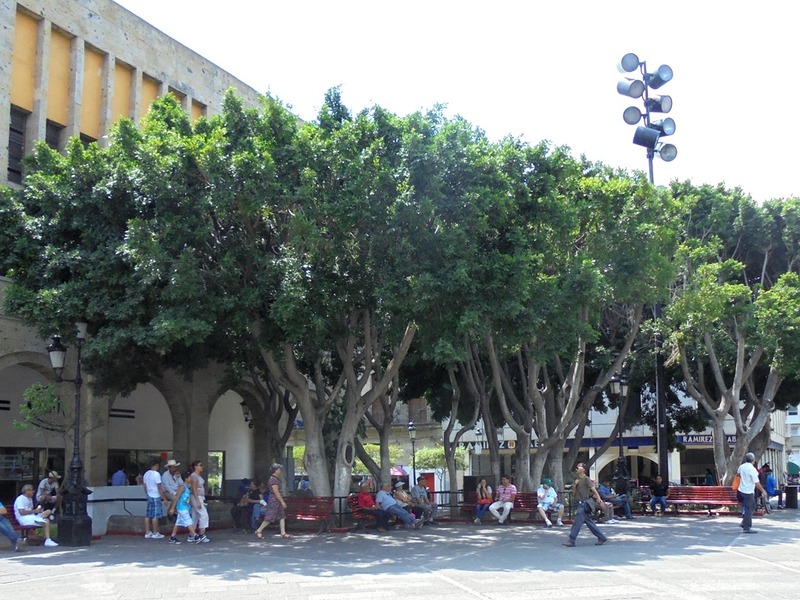 More trees make a shaded area to sit and talk. 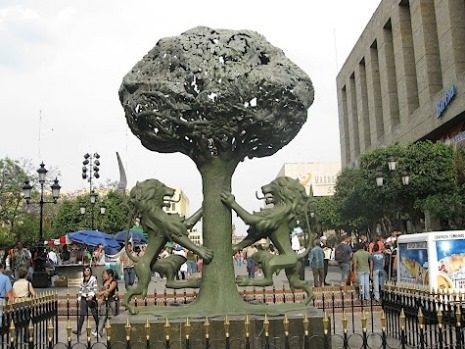 The coat of arms for Guadalajara is a bronze sculpture of two lions with their paws on an oak tree. Next to it are two six-meter plaques displaying the decree by King Charles I of Spain recognizing the city and its crest. 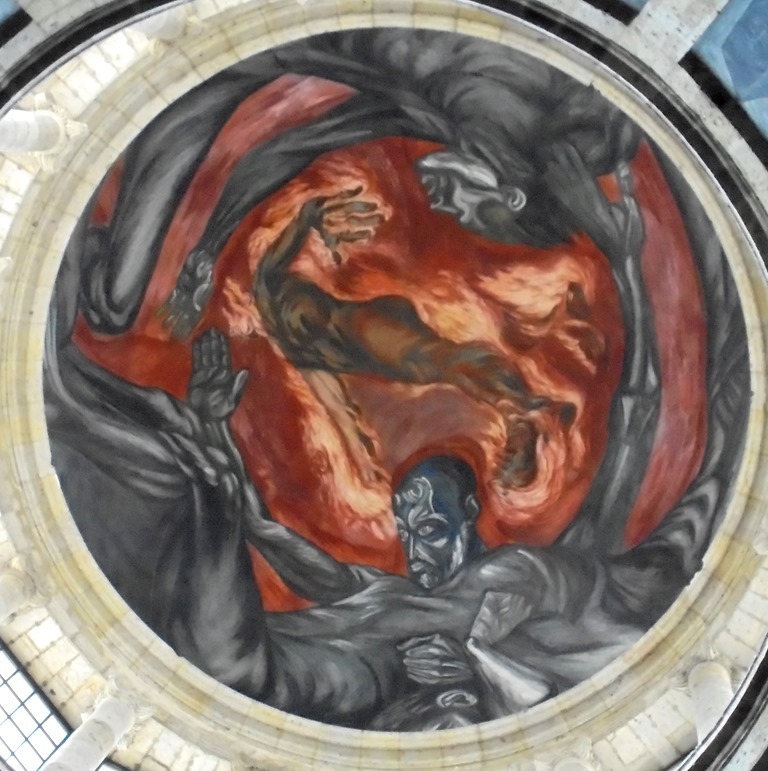 The Immolation of Quetzalcoatl, Fuente de la Inmolación de Quetzalcóatl. 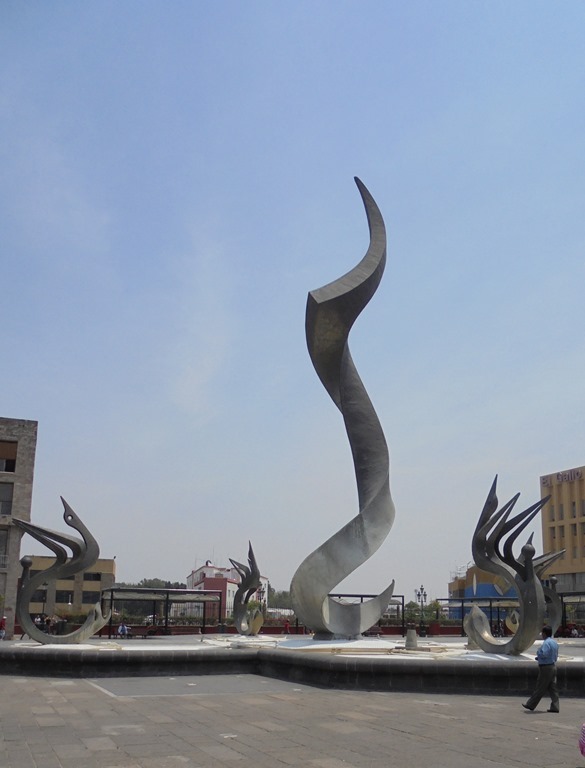 This monumental sculpture consists of five bronze forgings, hand carved. The central figure is 25 meters high and six meters across. 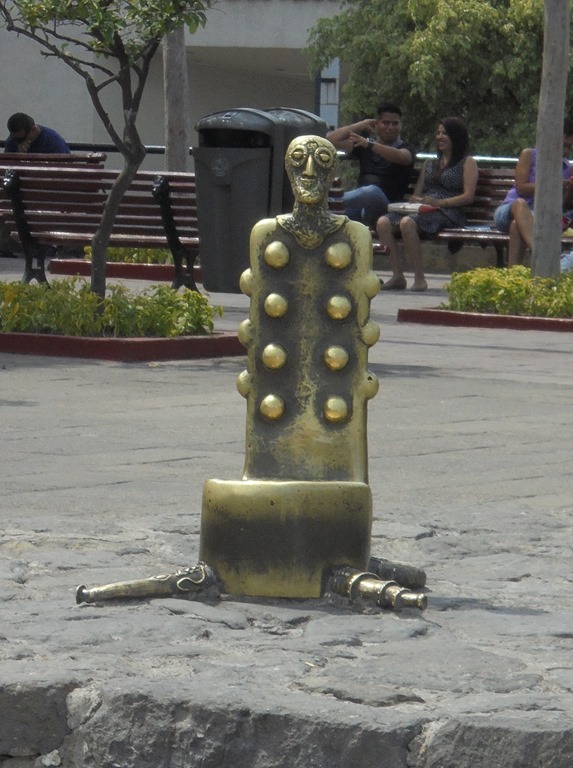 It is the work of Jalisco artist Victor Manuel Contreras. It was made between 1980 and 1982. His paintings and sculpture have been exhibited at the Institute of Modern Art in New York, and many other places including the Sorbonne and at the College of Fine Arts in Paris. He was called, “a painter who paints dreams.” It represents the sacrifice of Quetzalcoatl rising from the earth to infinity to turn the sun and give us new light. 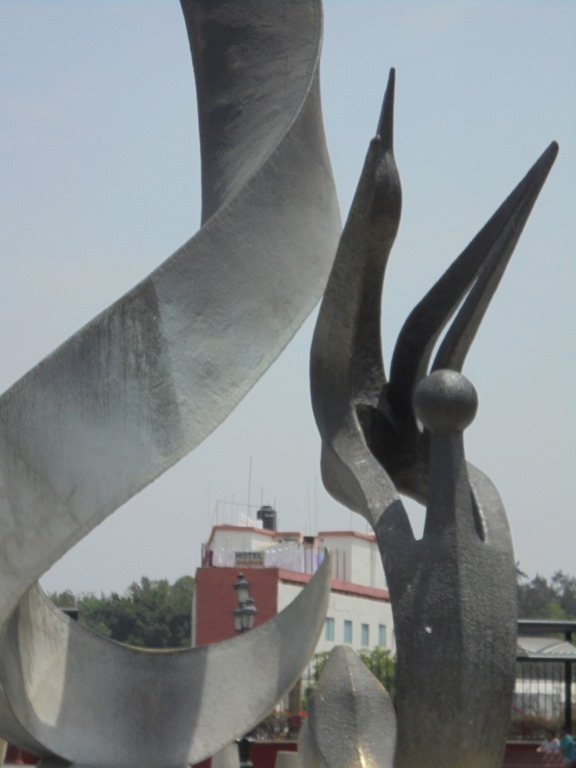 The four sculptures that surround the flame are the four heavens of the four cardinal points. 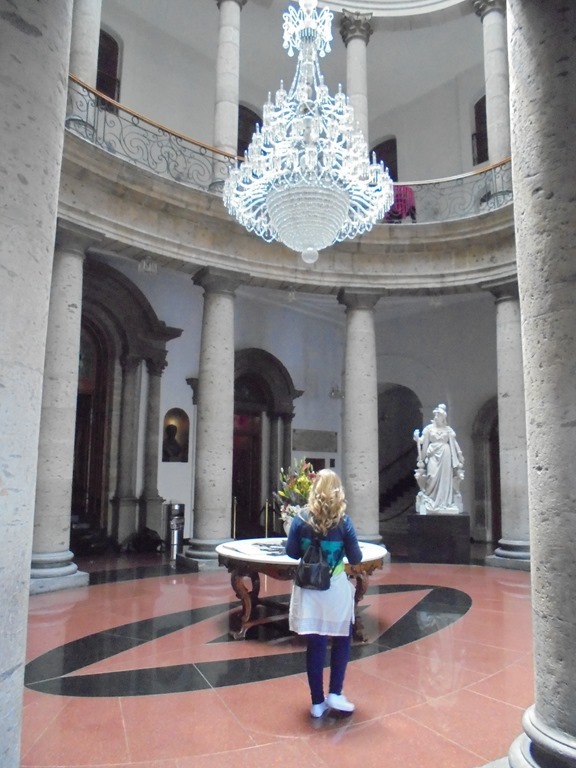 The rose cement underlying and supporting this sculpture is a beautiful fountain as crystal mirror that balances and harmonizes this sculpture. 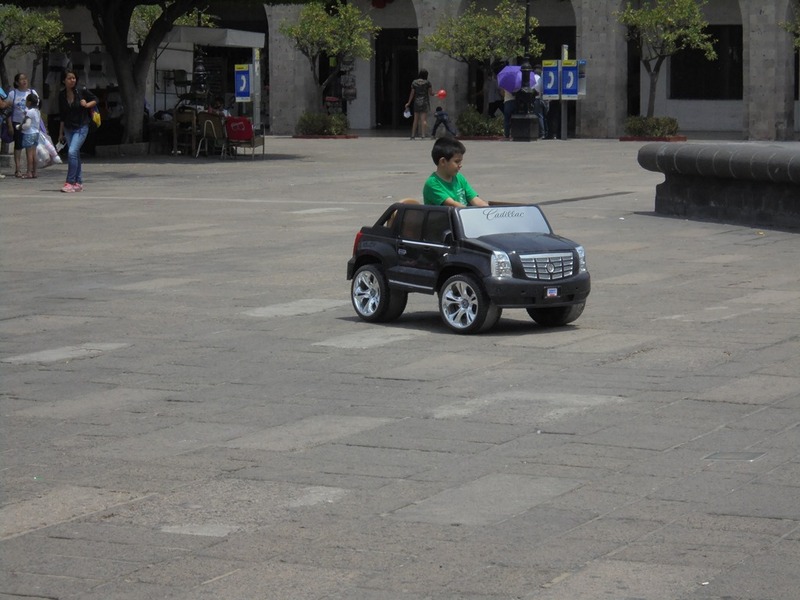 A boy, unaware of the magnificent fountain, drives the battery-powered rent a car around it. 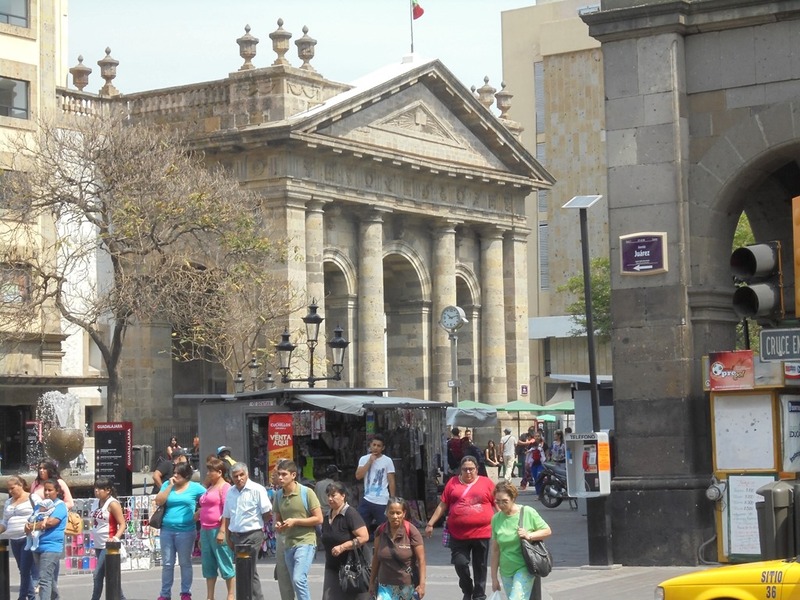 The main market in Guadalajara is in the San Juan de Dios neighborhood, the oldest in the city of Guadalajara. This neighborhood was born at the same times as the city itself. It was the first industrial and agricultural area, divided into large lots, which the first Spanish settlers transformed into gardens. 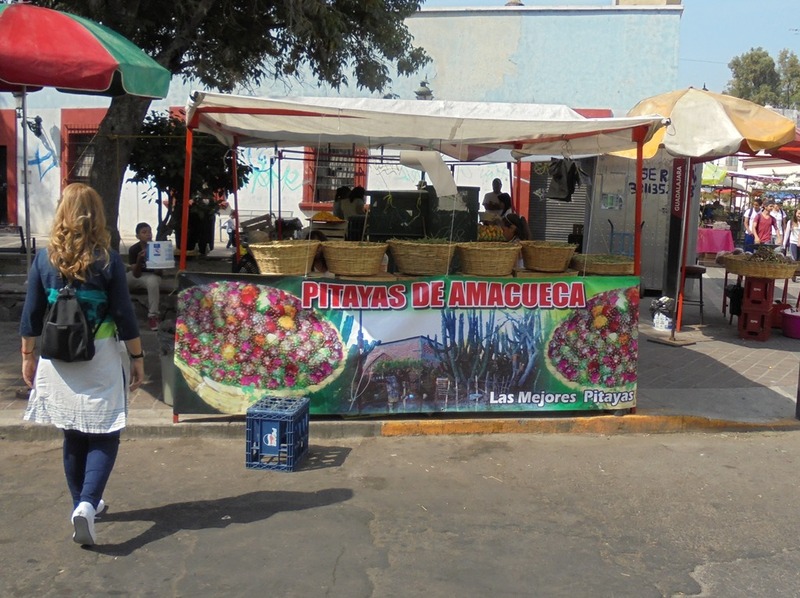 Travelers and visitors stopped here to sell their food and other items to the people of Guadalajara. 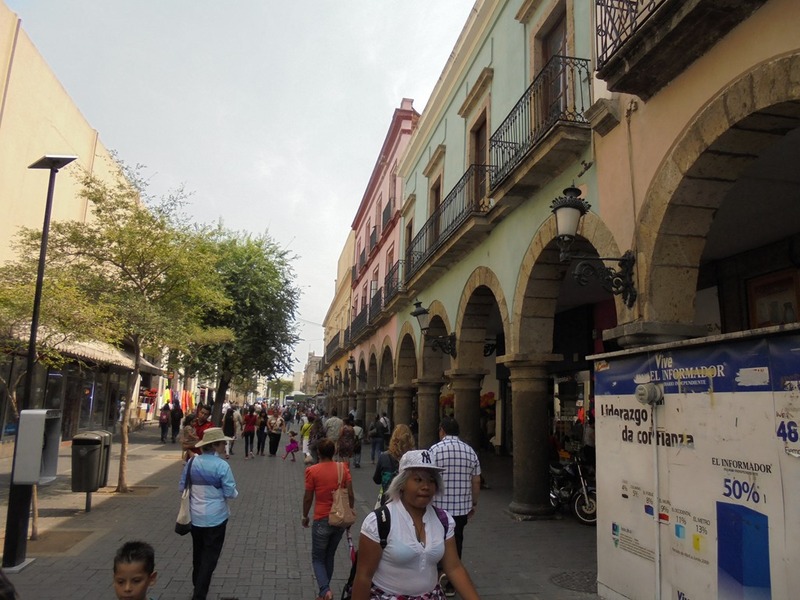 Guadalajara was relatively wealthy even then, and so offered a good opportunity for sellers. 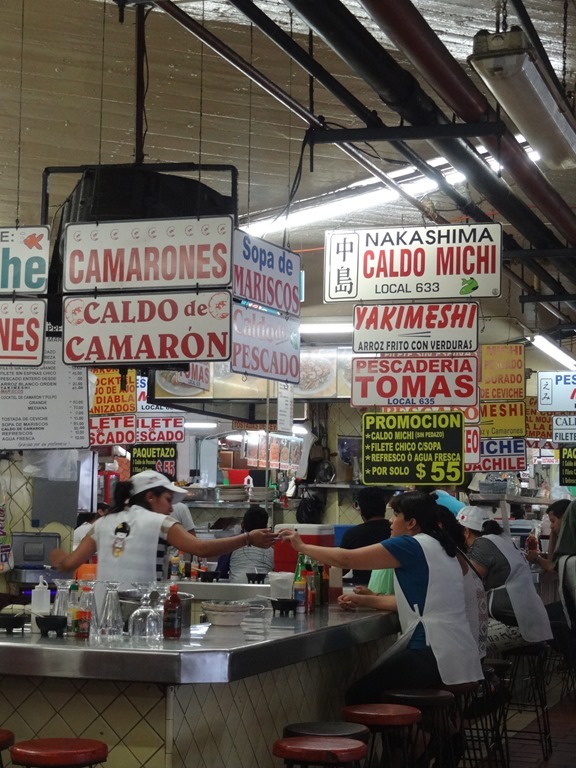 The market is also known as “Liberty Market,” Mercado San Juan de Dios, or “San Juan de Dios Market.” The present structure is the largest indoor market in Latin America. 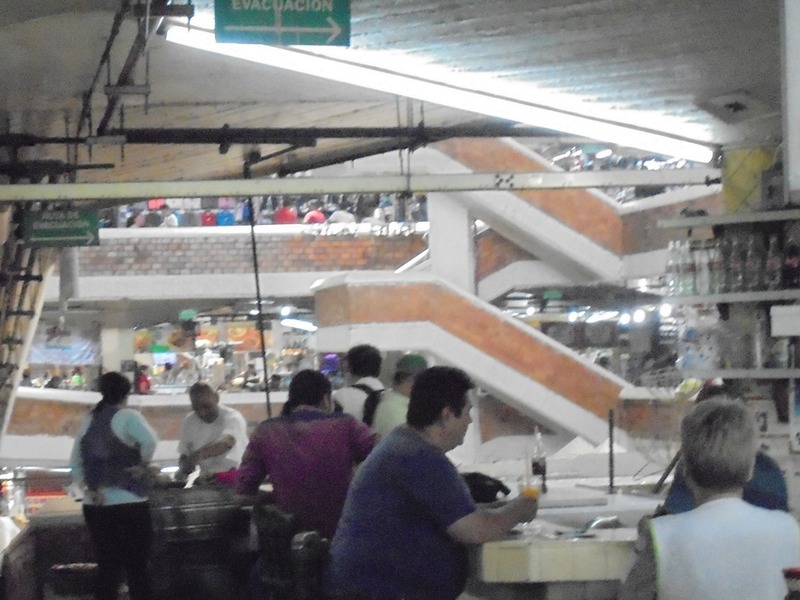 This market was inaugurated on December 30, 1958 and was designed by the architect Alejandro Zohn. 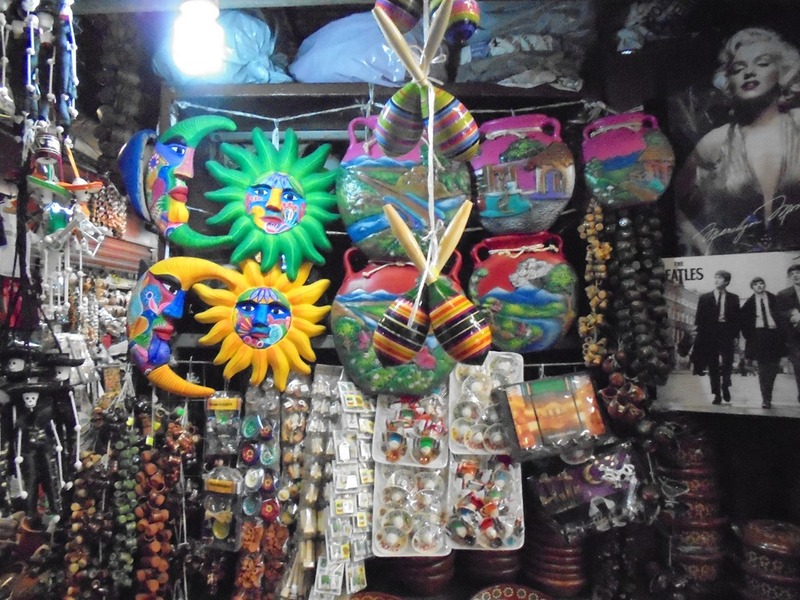 There are almost three thousand stalls in the market, selling practically everything, but especially craft items. The market has three levels and two parking lots. 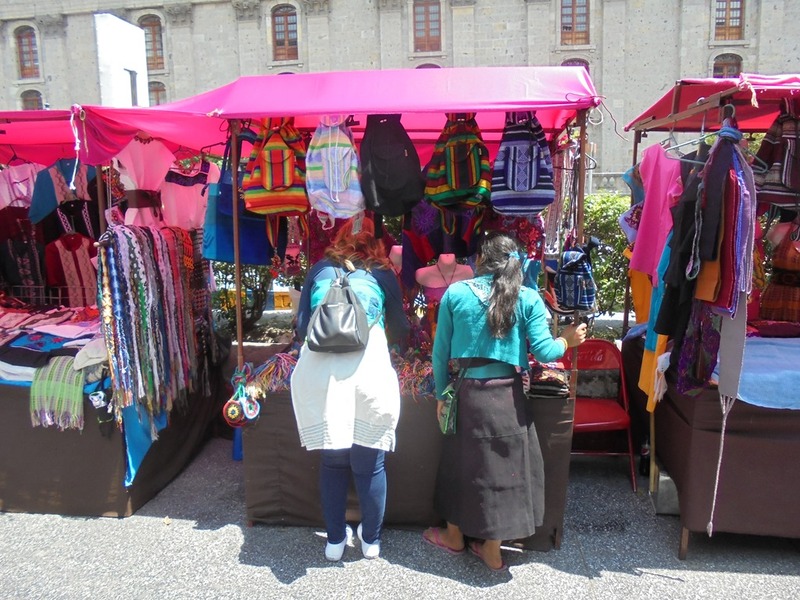 The first level has a section that includes stalls selling typical groceries and sweets as well as an area of stalls selling crafts. 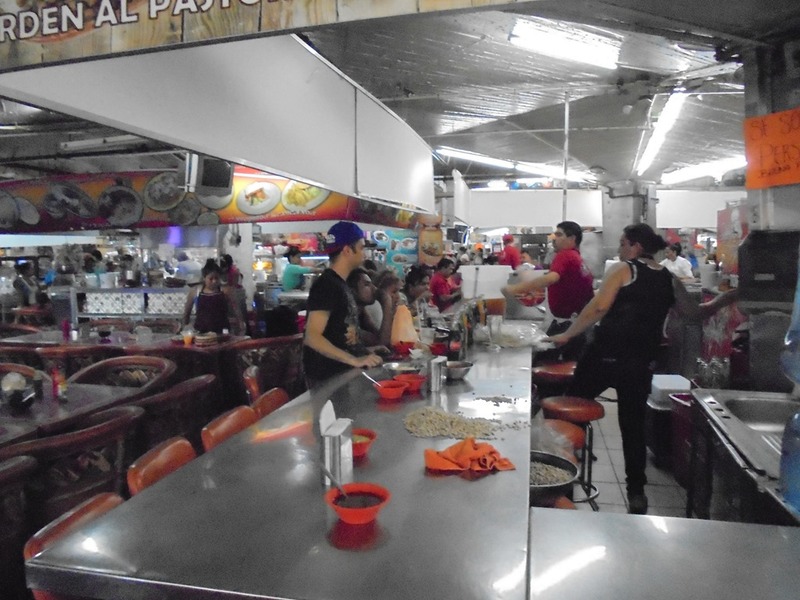 The second level includes small restaurants and food stalls selling typical foods of Guadalajara, such as tortas ahogadas (and other foods as well). The third level, the most recent addition, includes stalls selling imported goods, clothes, electronics, music, movies, computer equipment, paint, shoes, etc. 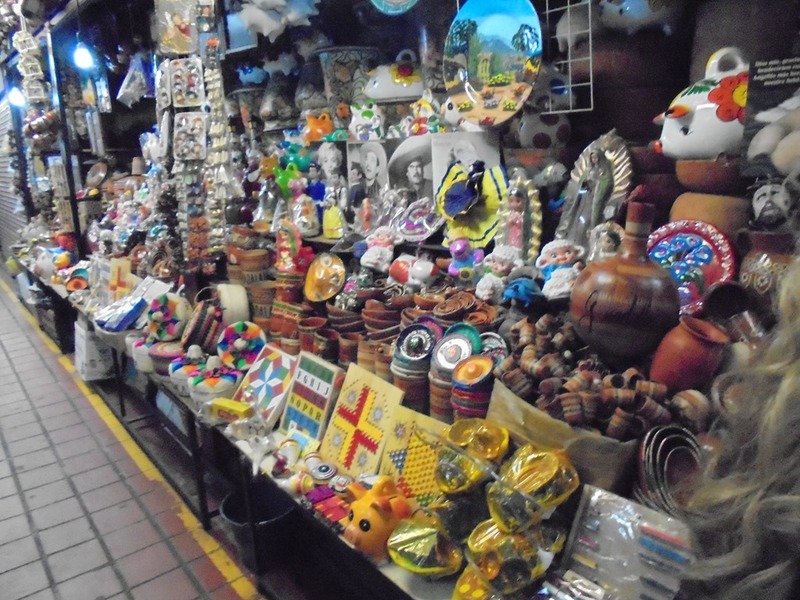 The market is open every day of the year and is visited by residents and tourists largely attracted by the craft stalls. 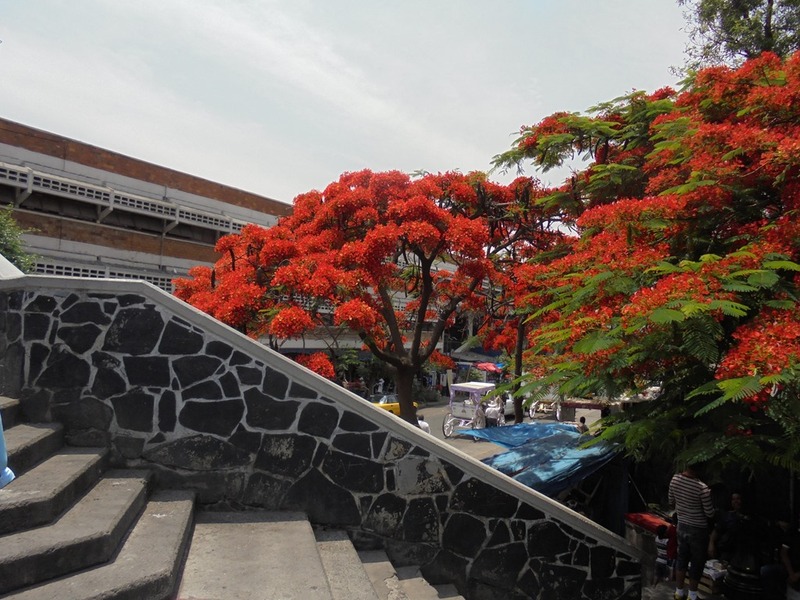 Trees with bright orange flowers line the stairs to the market. They look like the same kind as in India. We go into the food stall section. Chairs and counters line the walkway, all offering something to eat. Many places have big colorful signs to attract customer. 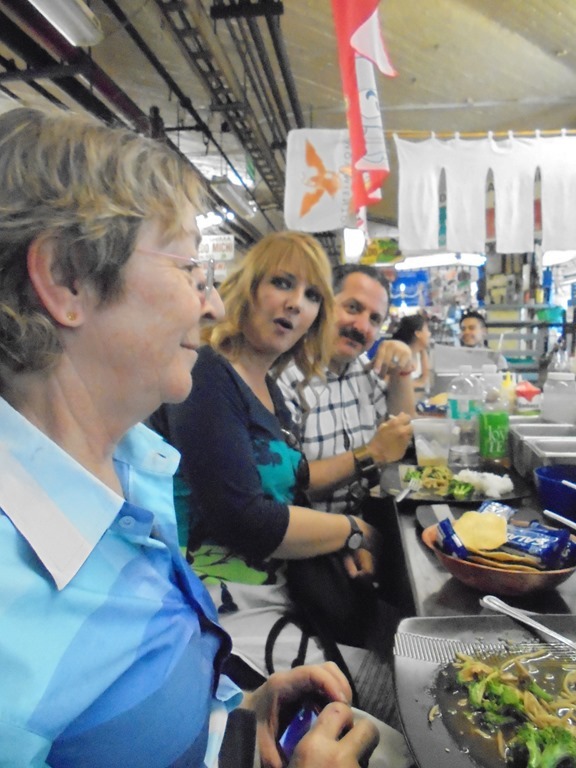 Cristina and her husband wanted to eat at the Japanese stall. They have eaten here before and enjoyed it. 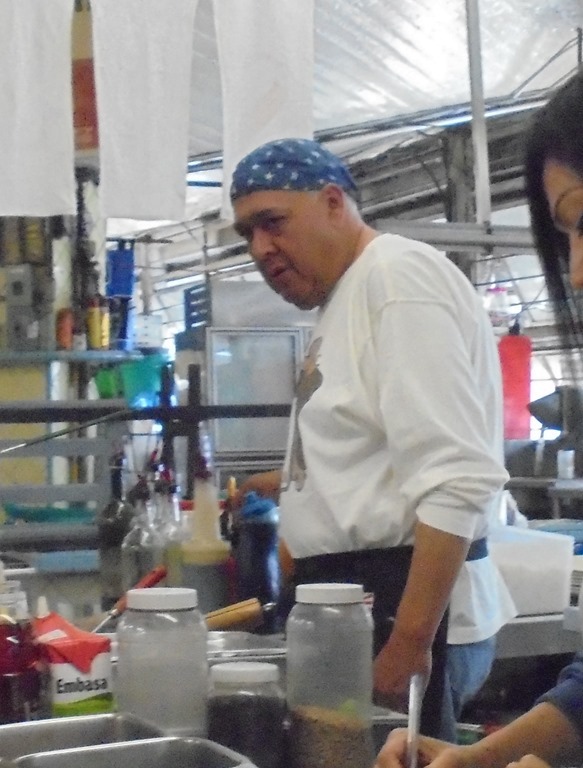 They seemed to know the man who ran the place, a Mexican who had spent years in Japan, learning the trade. 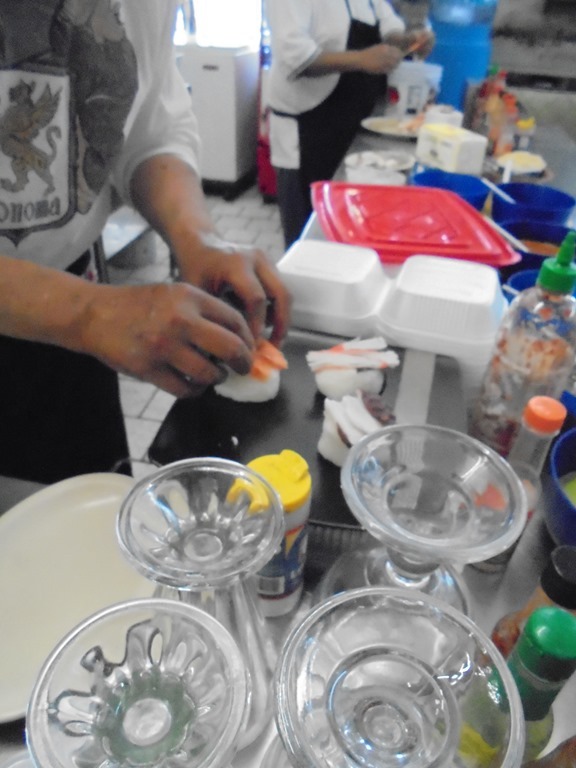 He is making us sushi. Here are my lunch companions, Carol, Cristina, and her husband Jose-Maria. One of our plates. 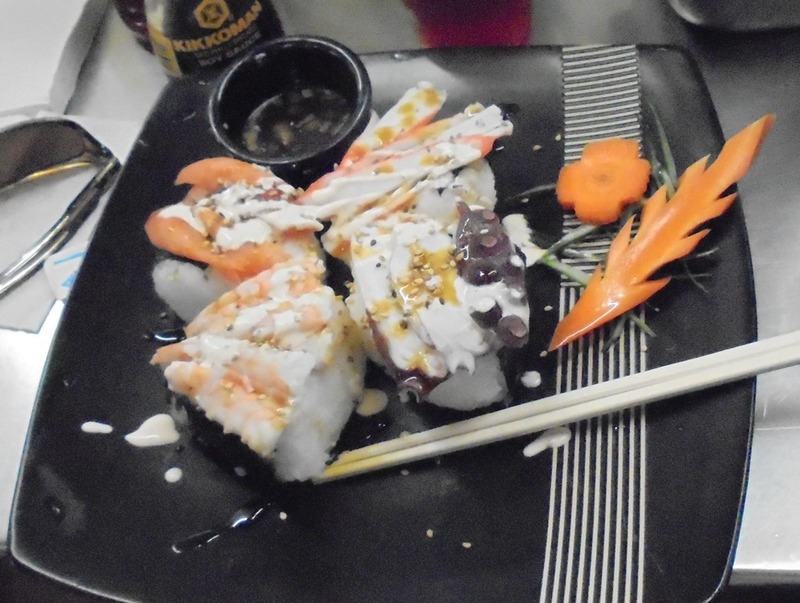 Big sushi. 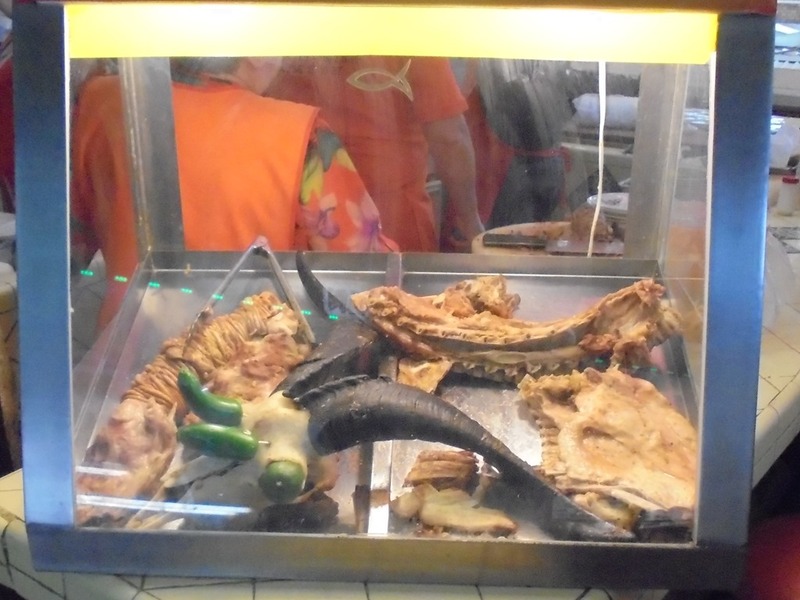 Some places have display cases to show off their food. I guess they serve goat skulls here (or, at least some kind of meat). Next we went into a crafts area. Wow, do they have crafts objects! Omnipresent skulls. 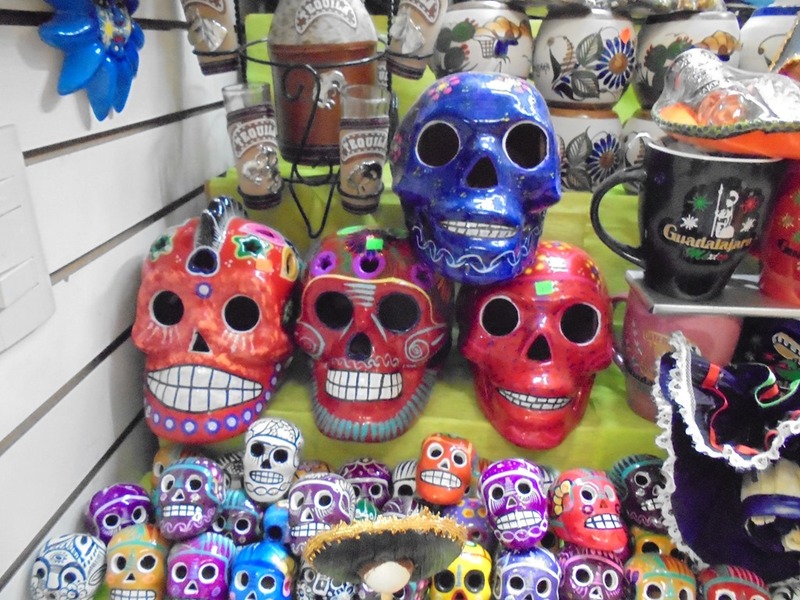 Skulls are used as a part of the Day of the Dead festivals, which is an important national holiday in Mexico. The use of skulls and skeletons in Mexican art originated before the Conquest. 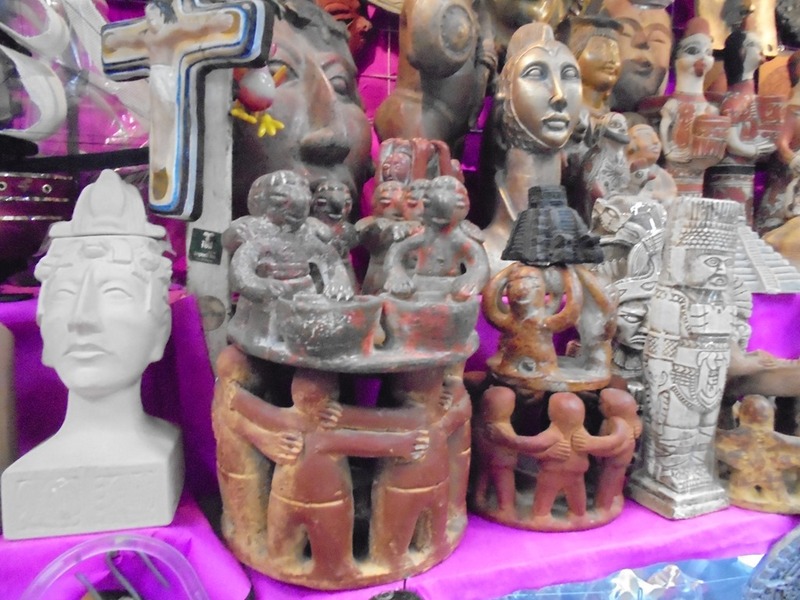 The Aztecs excelled in stone sculptures and created striking carvings of their gods. The worship of death involved worship of life, while the skull – symbol of death – was a promise of resurrection. Now the skull motif is also used in decoration. I really like this ceramic sculpture of a native woman. It is particularly evocative to me. 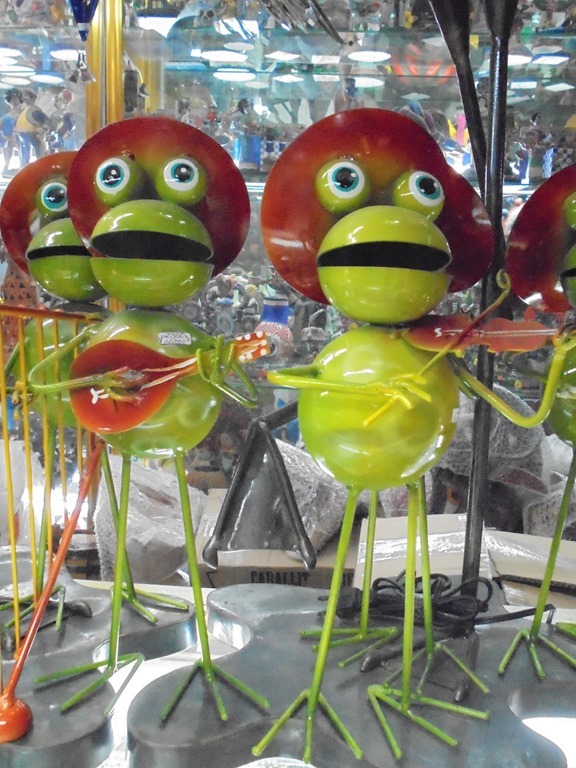 Just what we need, man-sized metal frog Mariachi musicians. We could even put speakers in them to have music come from them. 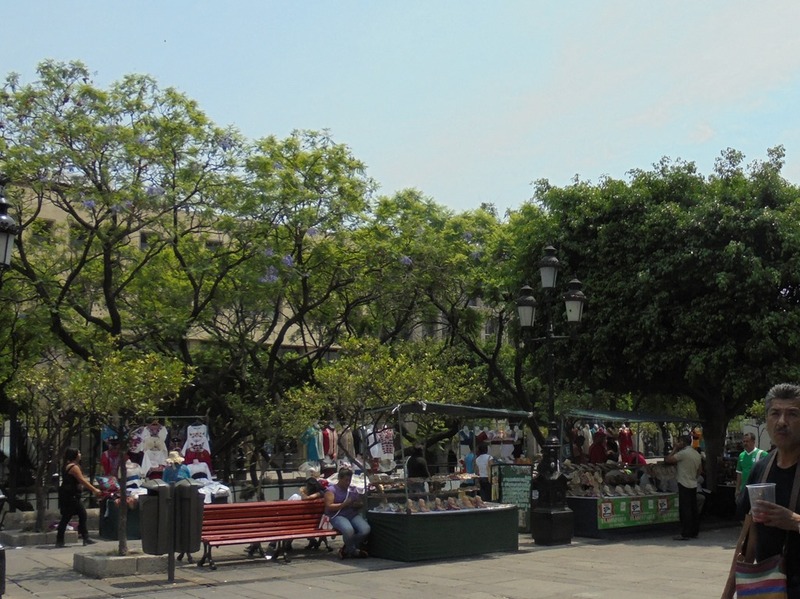 In the center of the Mercado is an open area. In it are pets. 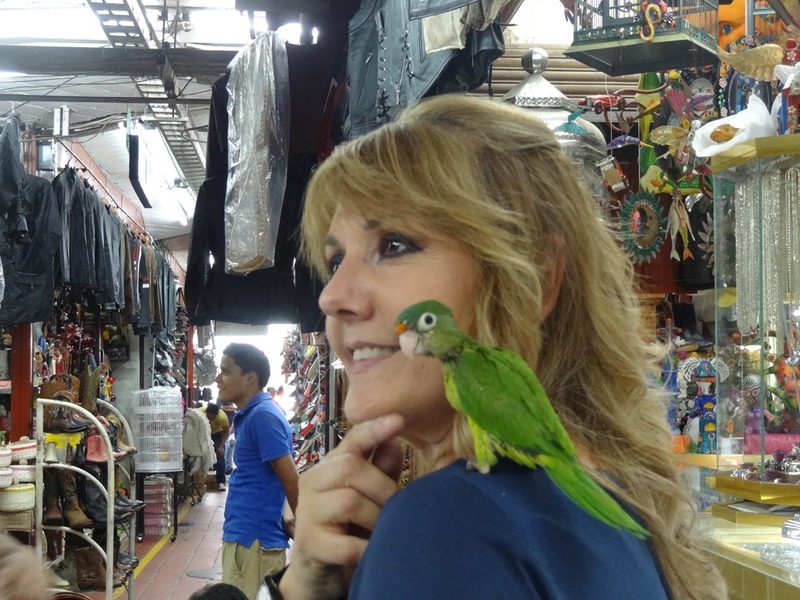 Both Carol and Cristina were fascinated by the birds. 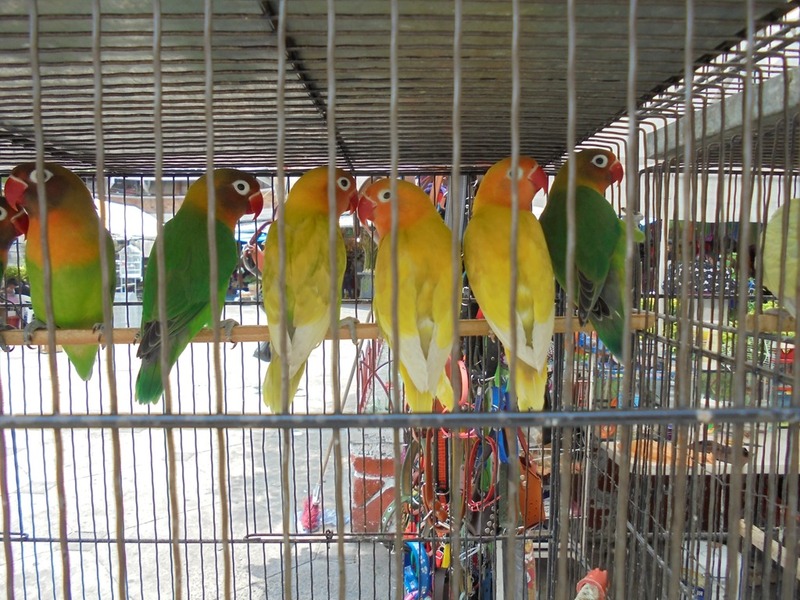 Healthy looking birdies. Close quarters through. The bird guy will give you a parrot to play with. 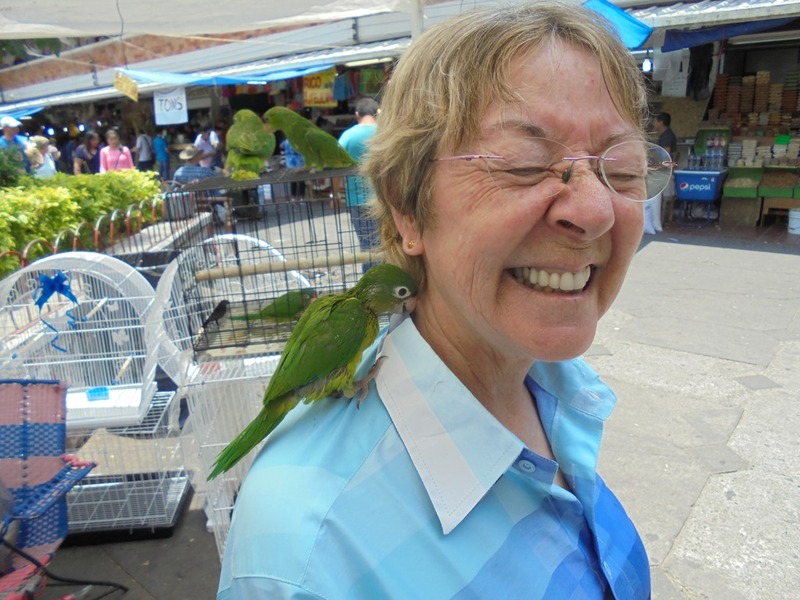 Carol really likes these birds. Can’t you tell from the photo? 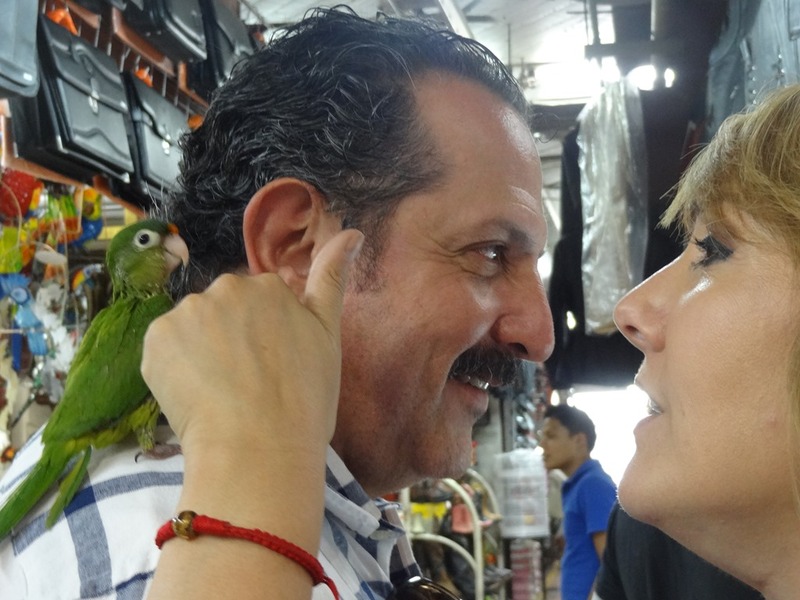 Cristina put hers onto Jose-Maria‘s shoulder. It looks cute and comfortable on her shoulder. Its colors complement her outfit. She should bring it home! Alas, it was not to be. 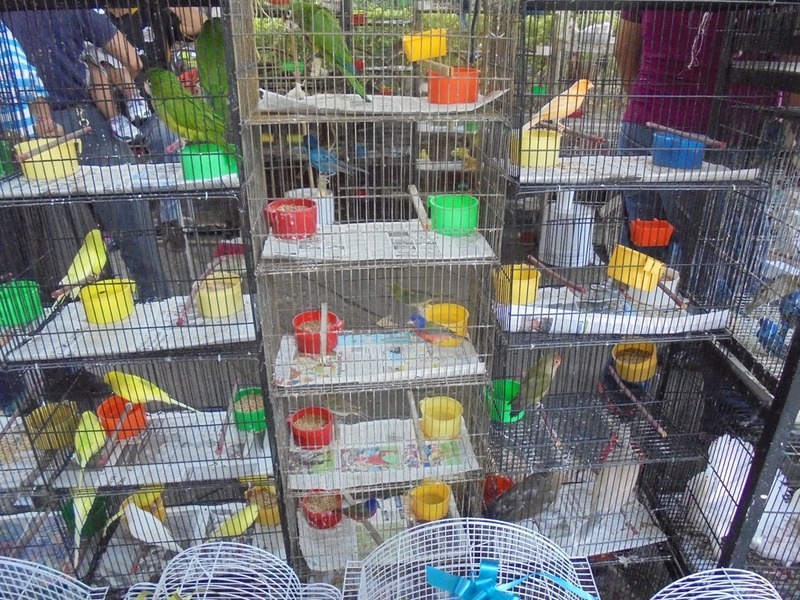 She left the parrot at the aviary, and went home empty-shouldered. More stuff. 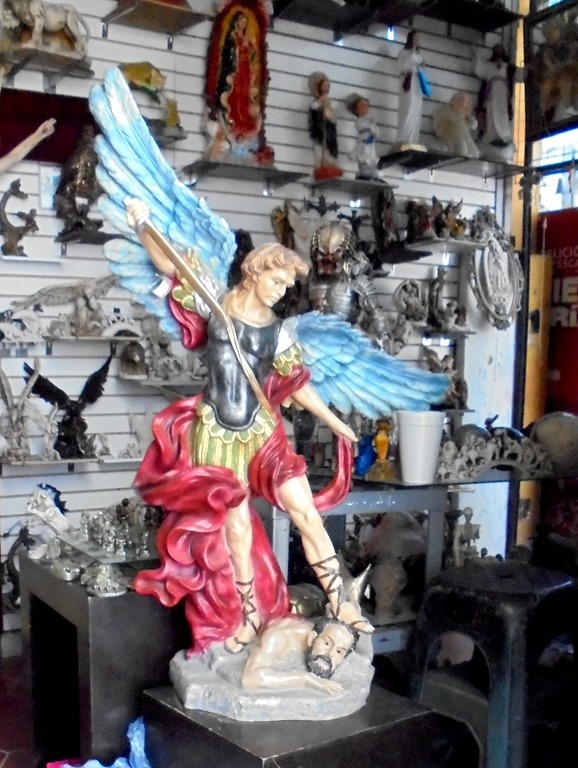 A large painted ceramic Arch Angel Saint Michael defeating Lucifer. There is a big story surrounding this figure. San Miguel, also known as St. Michael, “Prince of the heavenly host of angels,” is one of only three angels mentioned by name in the Bible. He is the defender of the Church, and chief opponent of Satan. Traditionally, Miguel is called upon to rescue the souls of the faithful in their constant battle with the forces of evil, during life and at the moment of death. San Miguel is revered in Mexico and Spanish speaking countries around the world. Devotion is demonstrated by the many churches and missions named for St. Michael. 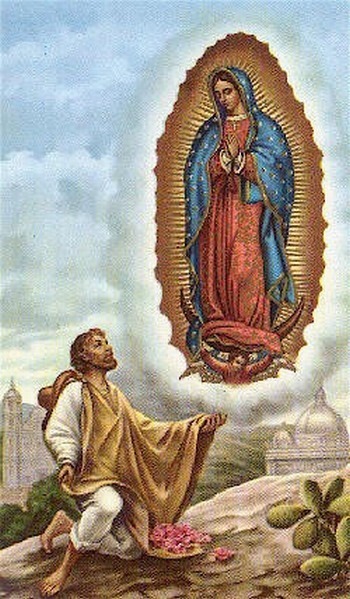 In Mexico, there is a tradition that it is Juan Diego holding up Our Lady of Guadalupe. 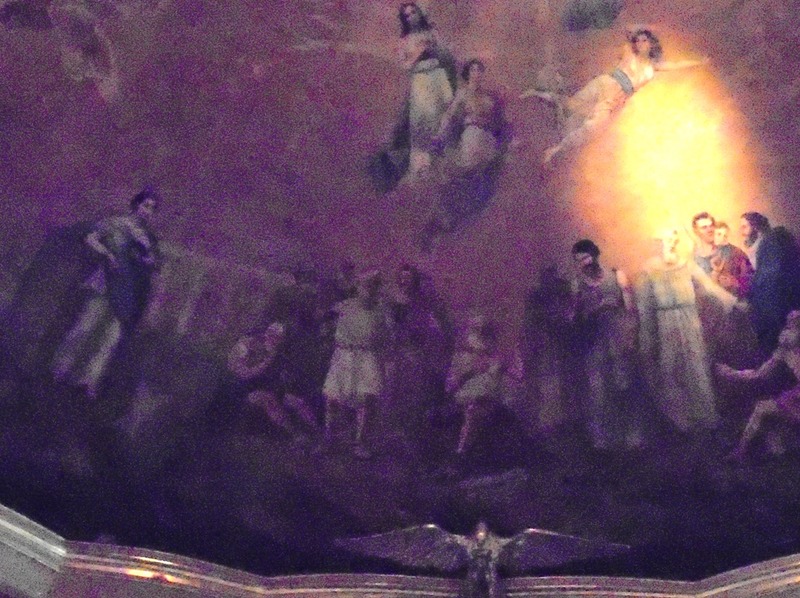 This is one of the most important Catholic Mexican cultural history stories. Juan Diego was a local peasant. The official Catholic account of the founding of the Basilica of Our Lady of Guadalupe in México City declares that on the morning of December 9, 1531, he saw a vision of a maiden at the Hill of Tepeyac, which would become part of Villa de Guadalupe suburb of Mexico City. 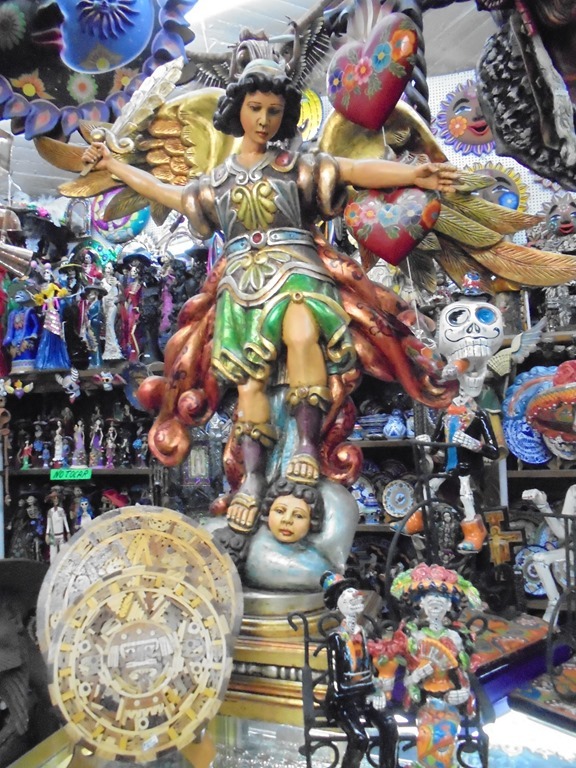 Speaking in his native Nahuatl language (the language of the Aztec empire), the maiden identified herself as the Virgin Mary, “mother of the very true deity” and asked for a church to be built here in her honor. From her words, Juan Diego then sought out the archbishop of Mexico City, Fray Juan de Zumárraga. The archbishop instructed him to return to Tepeyac Hill, and ask the lady for a miraculous sign to prove her identity. The first sign she gave was the healing of Juan’s uncle. The Virgin also told Juan to gather flowers from the top of Tepeyac Hill, which was normally barren, especially in December. Juan followed her instructions and found Castilian roses, not native to Mexico, blooming there. Juan arranged the flowers in his tilma, or cloak, and when Juan Diego opened his cloak before archbishop Zumárraga on December 12, the flowers fell to the floor, and on the fabric was the image of the Virgin of Guadalupe. Fray Zumárraga built the church as directed. 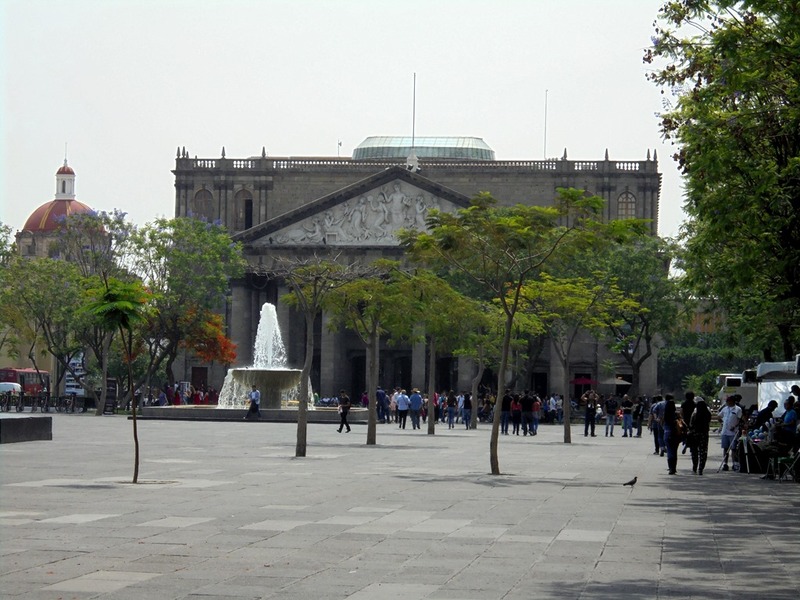 Now the Basilica of Guadalupe is a world’s major center of pilgrimage for Roman Catholics, receiving 22 million visitors in 2010. 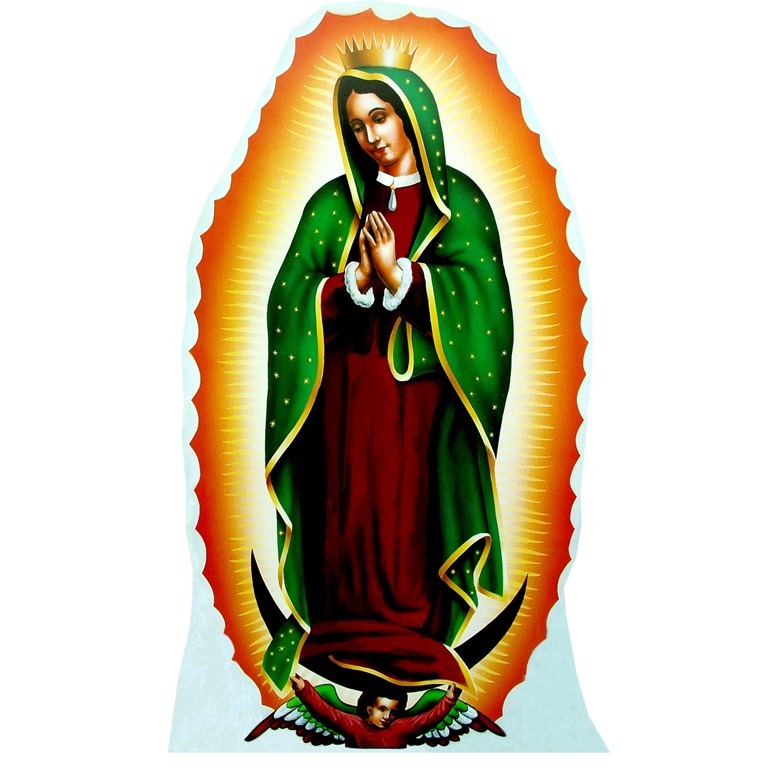 This Guadalupe event, (in Spanish “el acontecimiento Guadalupano“), is the basis of the cult of Our Lady of Guadalupe which is everywhere in Mexico and throughout South and central America. Saint Juan Diego is the first Roman Catholic indigenous saint from the Americas. Our Lady of Guadalupe. Image from nilimahome.com. December 9 marks the feast day of Saint Juan Diego and December 12 is the feast of Our Lady of Guadalupe. There is a lot of story behind this figure! San Miguel can help you overcome the challenges in your life, and assert your unique Mexican identity. He can also add some color needed for that special place in your casa. 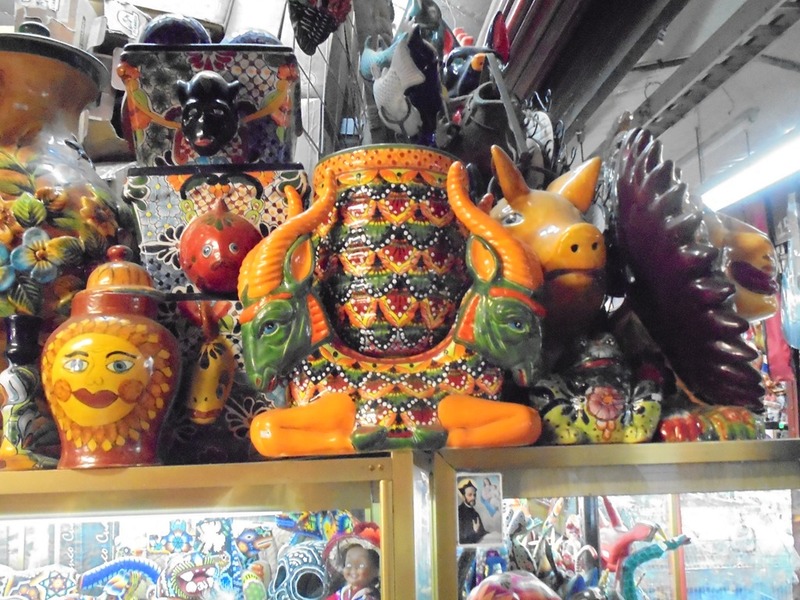 Here is another ceramic San Miguel that we saw on an earlier trip to Tonala. 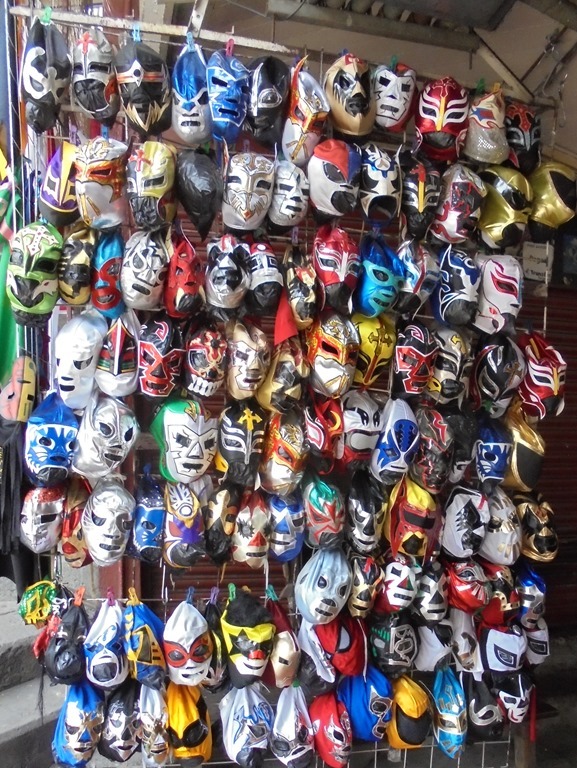 Lucha libre wrestling is popular in Mexico and beyond. Lucha libre is free-style wrestling, usually wearing masks. These masked figures become famous. Maybe you can find the mask of your favorite star here? I saw a man on the street actually wearing such a mask. 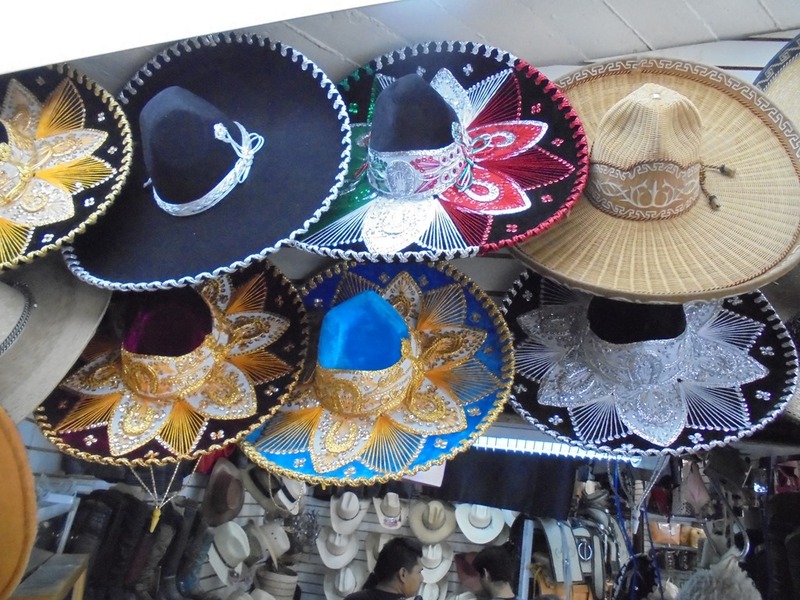 You can find a great sombrero to wear on a sunny day (or to decorate your wall). 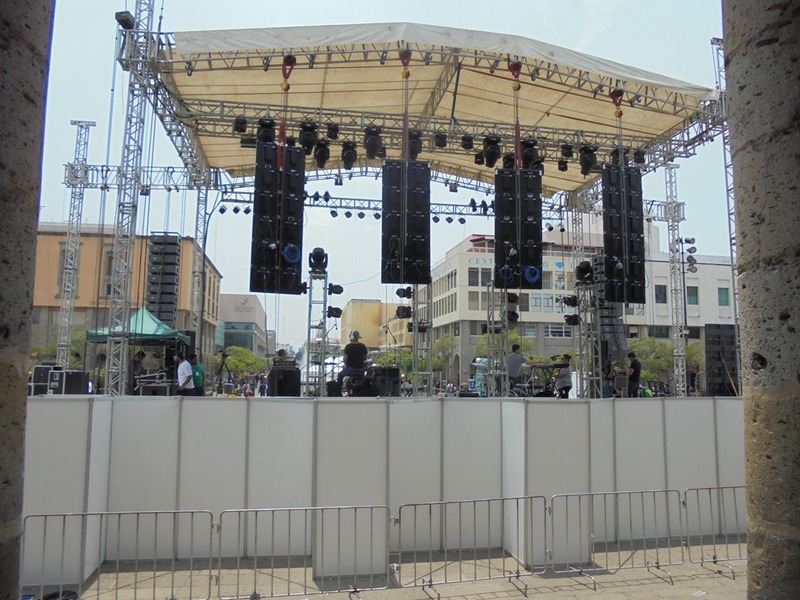 Walking through the square that fronts the west side of Hospicio Cabañas we see a big stage set up. 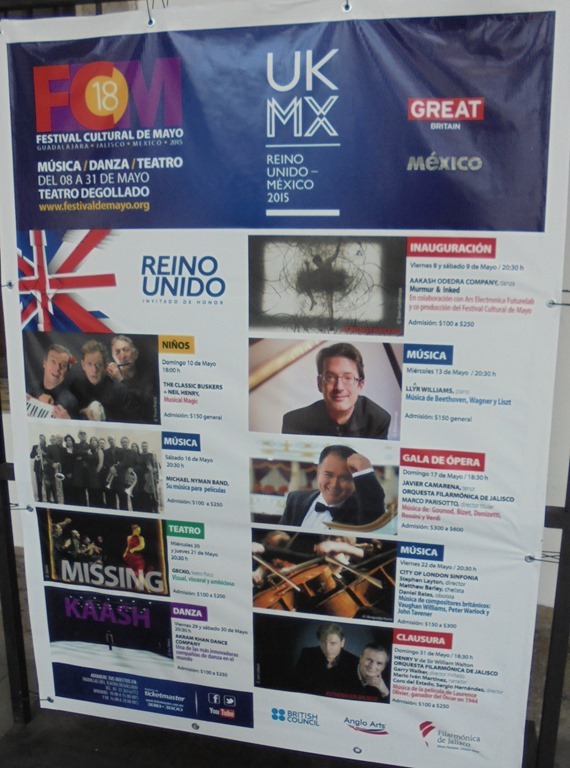 Maybe this is part of the Festival Cultural de Mayo, shown on this poster. There seem to be lots of events in this district. This is another historic old building, more than 200 years old. It is a World Heritage Site, and was one of the oldest and largest hospital complexes in the Americas. 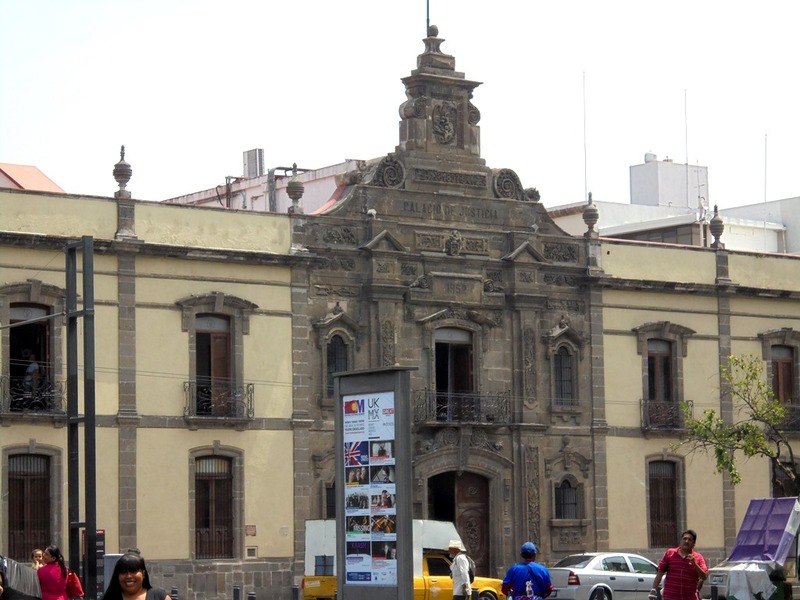 The Hospicio Cabañas was built at the beginning of the 19th century to provide care and shelter for the disadvantaged – orphans, old people, the handicapped and chronic invalids. This remarkable complex, which incorporates several unusual features designed specifically to meet the needs of its occupants, was unique for its time. It is built on a rectangular plan measuring 164 meters by 145 meters (538 by 476 ft.) and contains a complex of single-story buildings laid out around a series of twenty-three courtyards varying in size and characteristics, designed for a variety of uses. 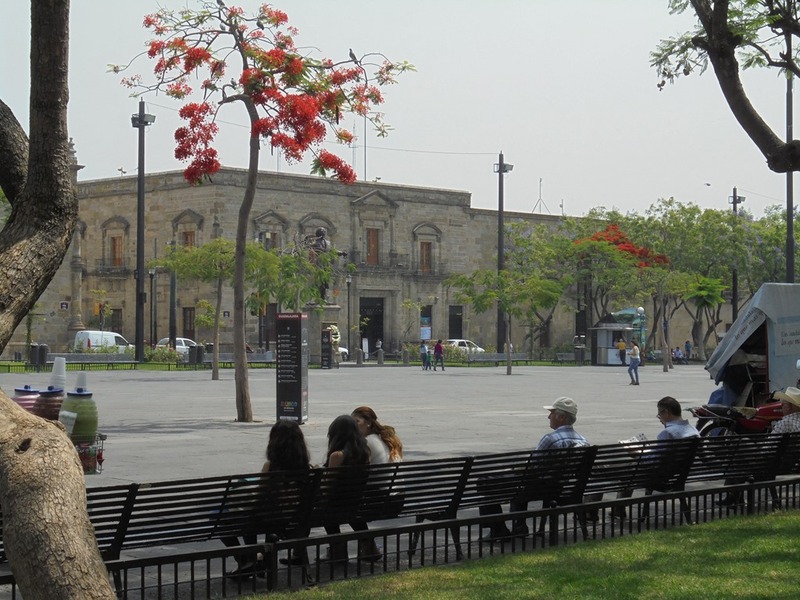 The complex was founded in 1791 by the Bishop of Guadalajara. 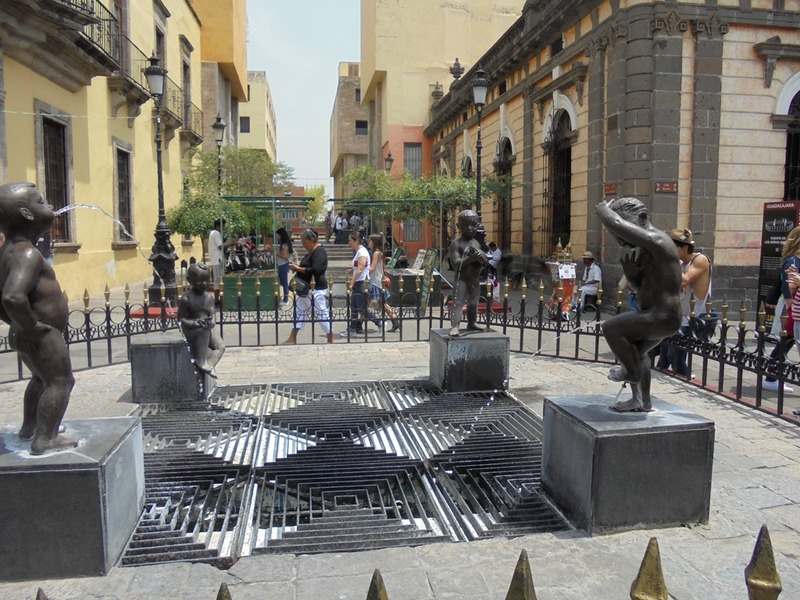 It owes its name to Juan Ruiz de Cabañas who was appointed to The See of Guadalajara in 1796 and engaged Manuel Tolsá, a renowned architect from Mexico City, to design the structure. Construction continued until 1829. 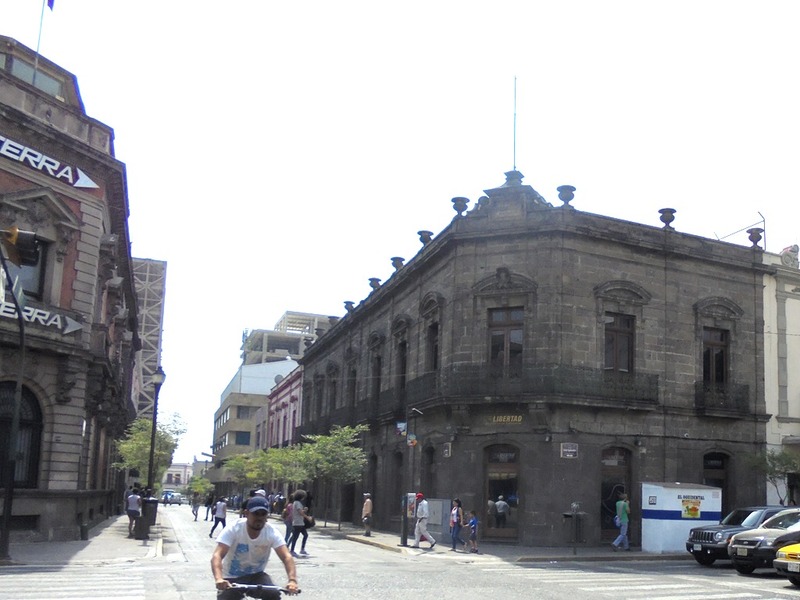 Although it served for a time as barracks in the mid-19th century, the hospital lasted well into the 20th century and continued to function until 1980, when the Cabañas Cultural Institute, with affiliated schools for arts and crafts, moved in. 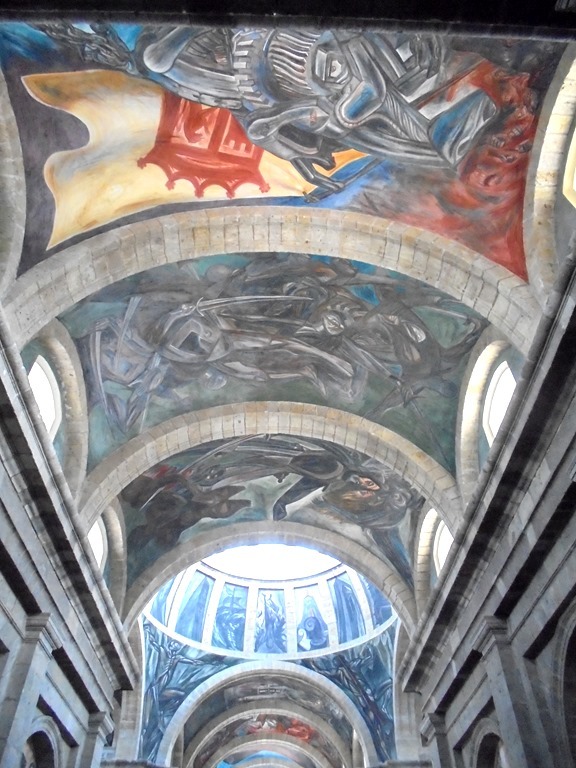 The highlight of the interior decoration is a series of monumental frescoes by José Clemente Orozco in the chapel, including one of his most famed creations, the allegory of The Man of Fire (1936–39). 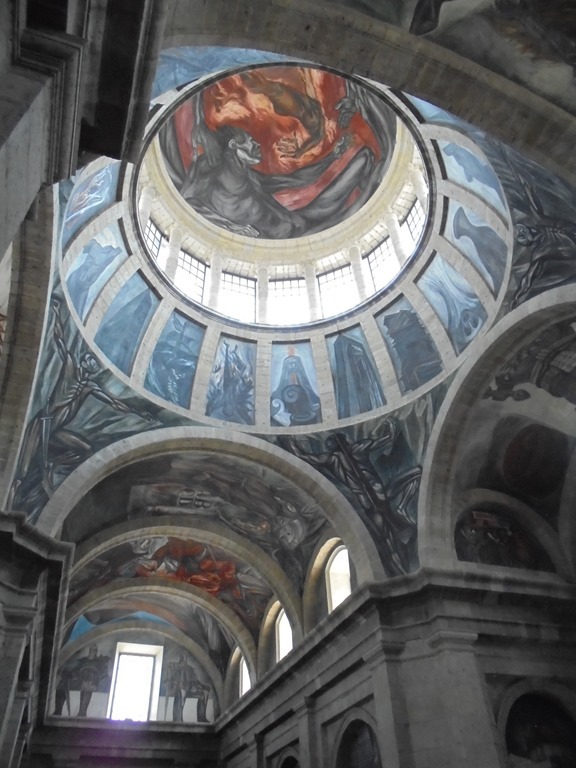 Highlights of these frescoes will be shown below. 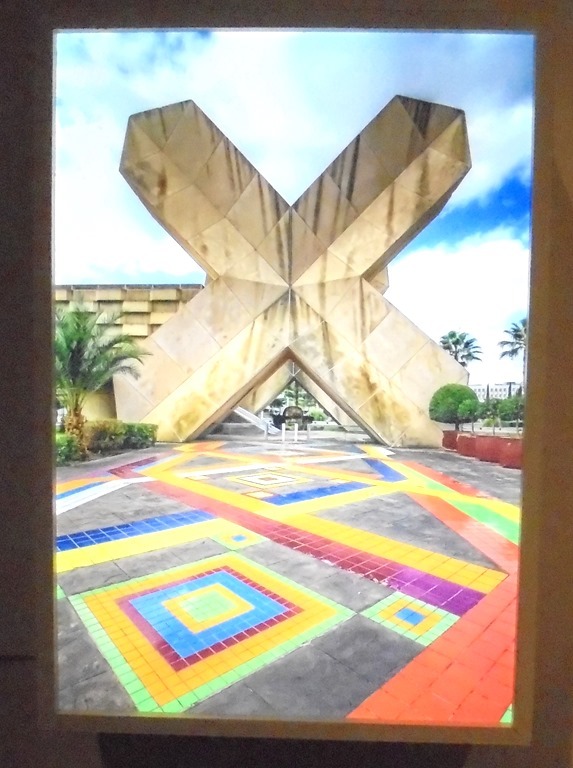 This is the entrance to the Chapel of Hospicio Cabañas from an interior courtyard. 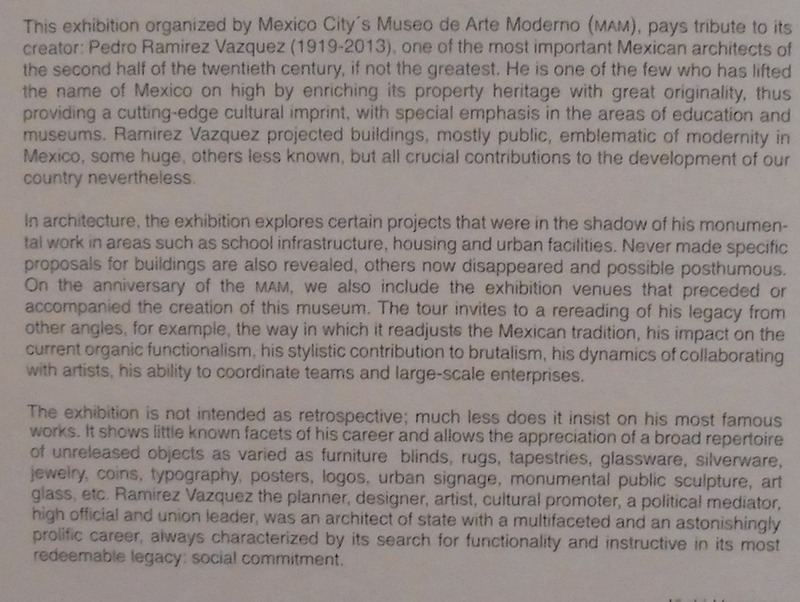 A sign details the largest part of today’s exhibition, “Pedro Ramirez Vazquez, unpublished and functional.” Pedro Ramirez Vazquez was a leading Mexican architect for more than 50 years until his death in 2013. 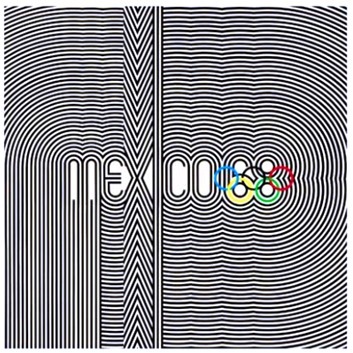 In addition to his many works for the Mexican government and the Mexico Olympics in 1968 (and throughout the world), One famous building is The Museum of Modern Art, in Mexico City. Pedro Ramirez Vazquez, was also a member of organizations such as the American Institute of Architects, International Union of Architects, Industrial Designers Society of America, a member of the Royal Society of Arts in England, a member of the Jerusalem planning committee, member of the Royal Academy of the Kingdom of Morocco, and a member of the International Olympic Committee. He received about 50 international awards and decorations. He is known for advanced and innovation designs. 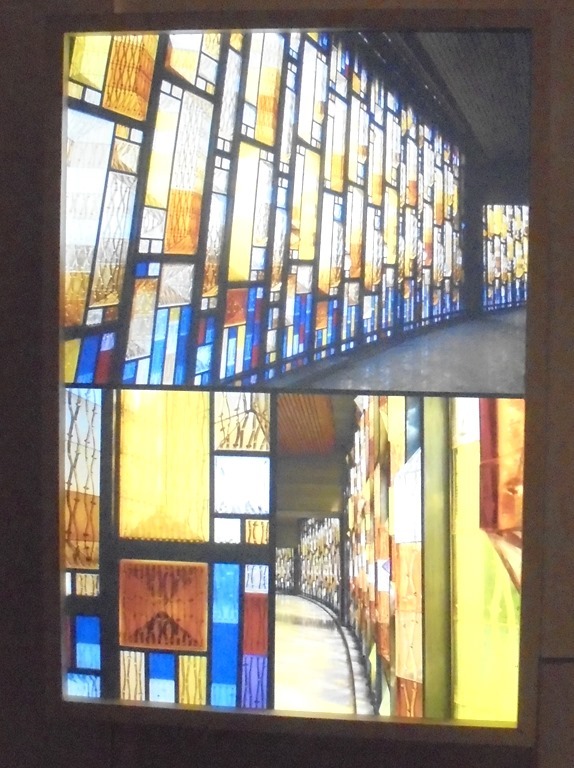 Here are some images of his work. Some are just designs, while some are, I think, actual buildings. 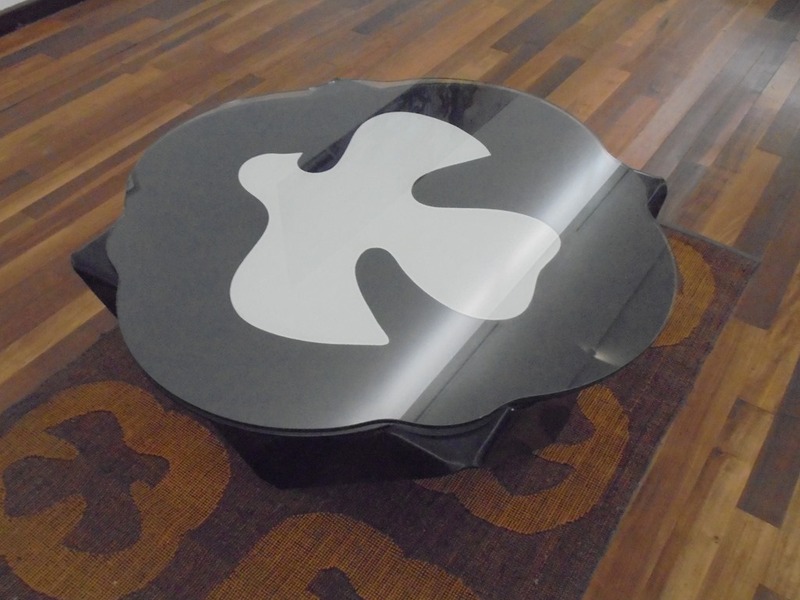 This small table displays the iconic Dove of Peace, a symbol of harmony for The Games of 1968. 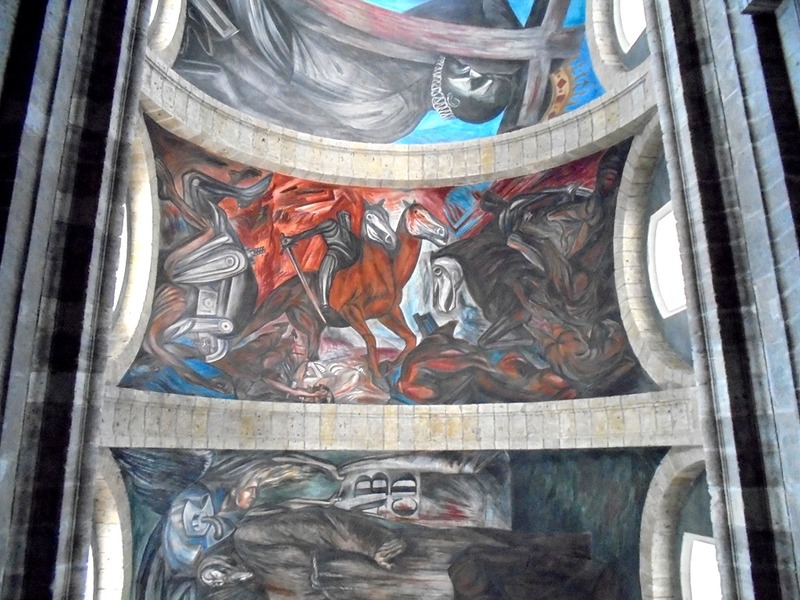 The highlight of the interior chapel is a series of monumental frescoes by José Clemente Orozco. In the center of the chapel is his most important work here called “The Man of Fire”, a human figure engulfed in flames, which represents the four elements of nature. An interior open space, with nice green wall. A pleasant change within the building. 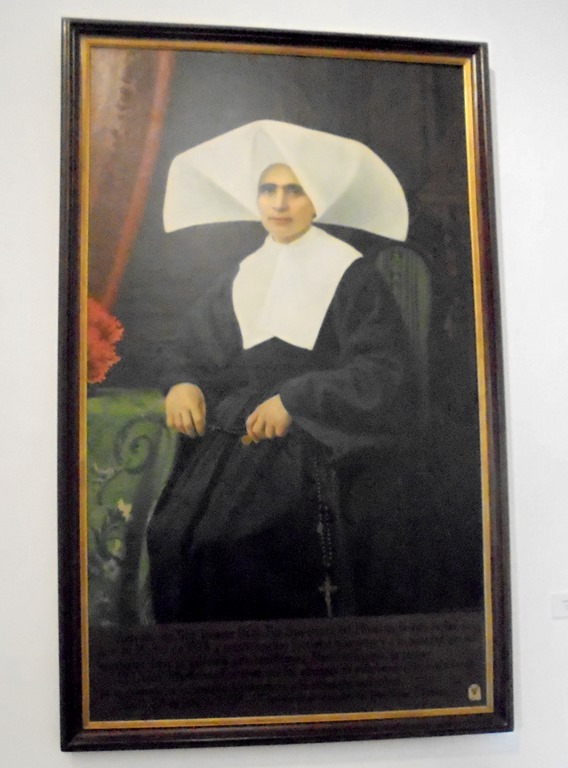 A painting of a nun, who surely was important in the early hospital. How about her hat? Anybody know who she is? 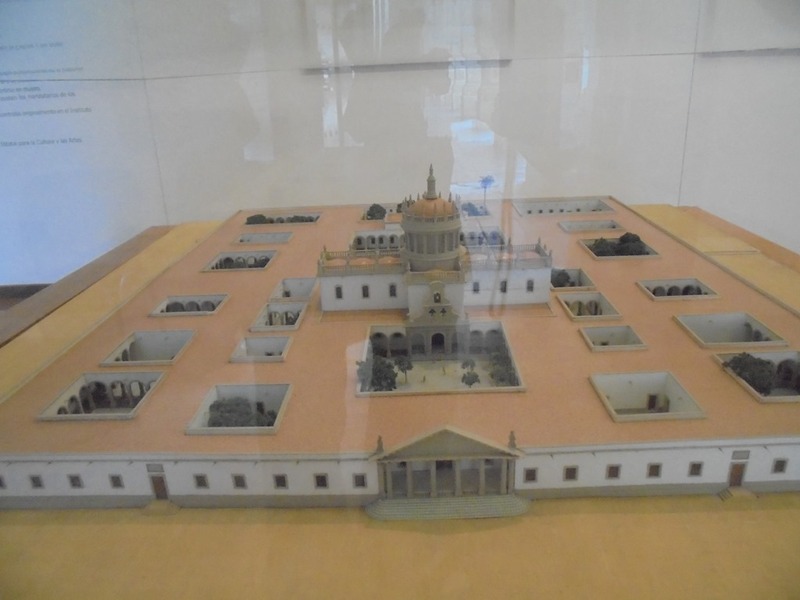 A model of The Hospicio Cabañas building. A beloved figure with two children. 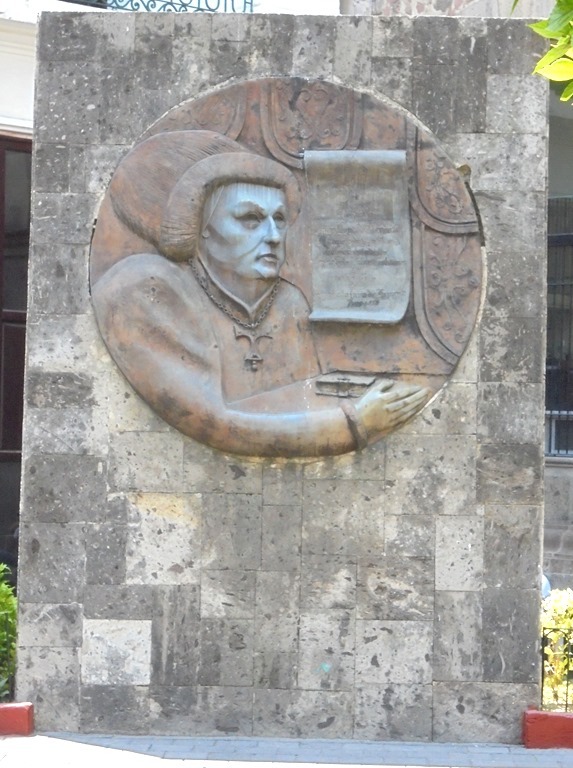 Maybe Juan Ruiz de Cabañas, the Bishop of Guadalajara who started the hospital project to begin with in 1791. We are out in the street again, facing an array of flagpoles and bronze statues. Here is one of the bronzes. There is probably another great sculptor we don’t know about. The last fountain of the day. A Flamenco dancer by the side of the walkway. 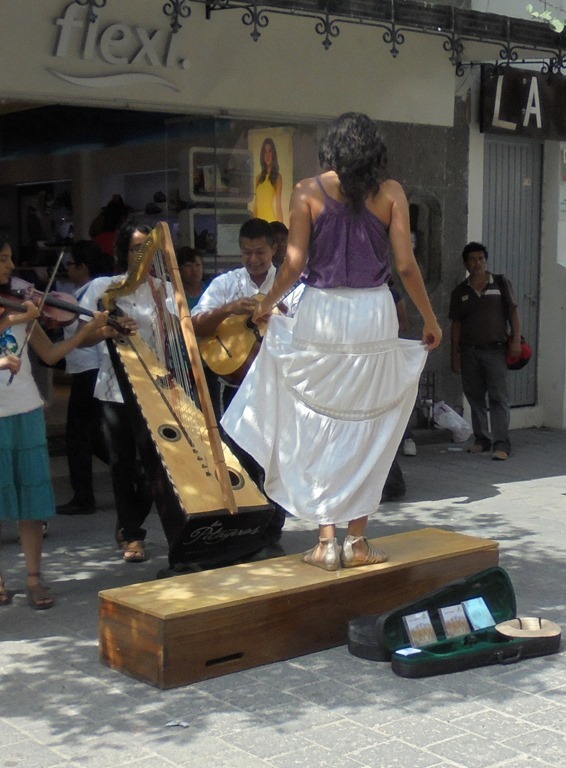 Even though she doesn’t wear traditional Flamenco shoes, she still made an impressive sound with her feet. Today’s walking route. If you made an equilateral triangle from both ends of the walk, that is about where the bus station is. 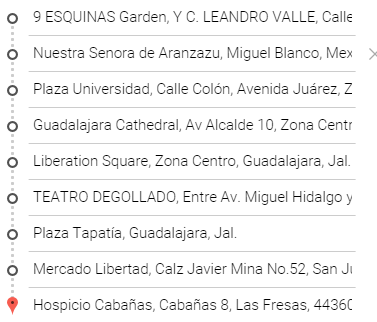 How to get this map from Google Maps. 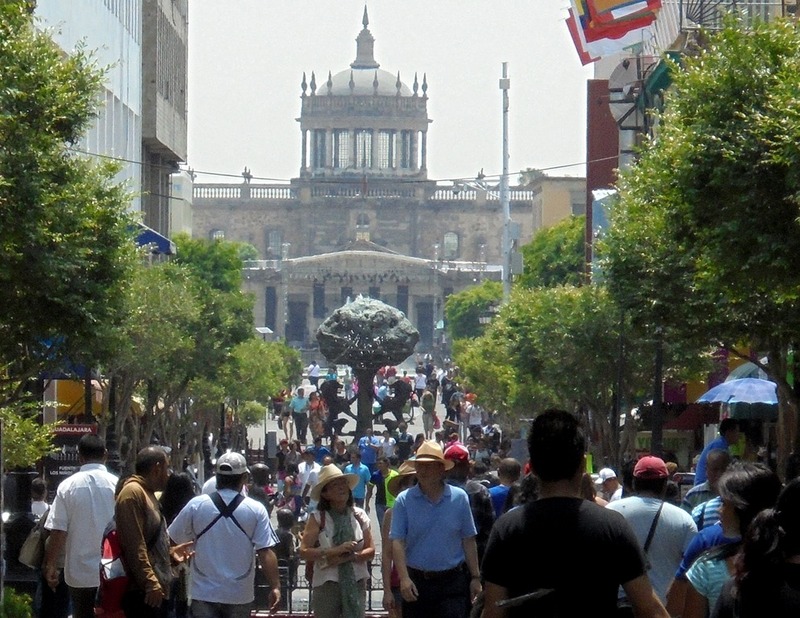 Wow, what a good start getting to know the interesting central part of Guadalajara. I appreciate better that this city has almost 500 years of history. We will make this trip again soon, I think, only this time on our own. Special thanks to Wikipedia and Google Translate. They both provided much information and help in writing this post. And, of course, we send abrazos y mucho cariño to our friends Cristina and Jose-Maria. Thanks for a wonderful day, amigos! This entry was posted on June 29, 2015 at 2:19 pm and is filed under Guadalajara, Travel outside India. You can follow any responses to this entry through the RSS 2.0 feed. You can leave a response, or trackback from your own site. I HAVE NOT SEEN ENOUGH YET .